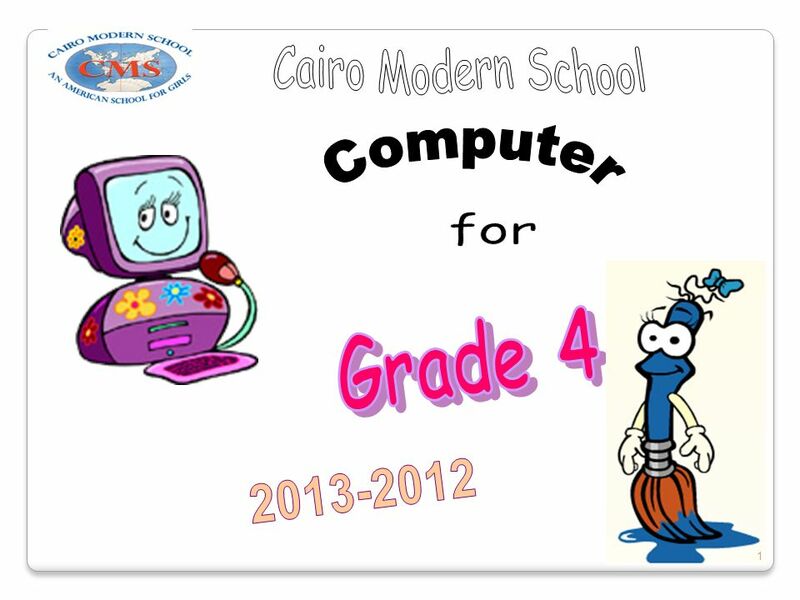 Cairo Modern School Computer for Grade 4 2013-2012. 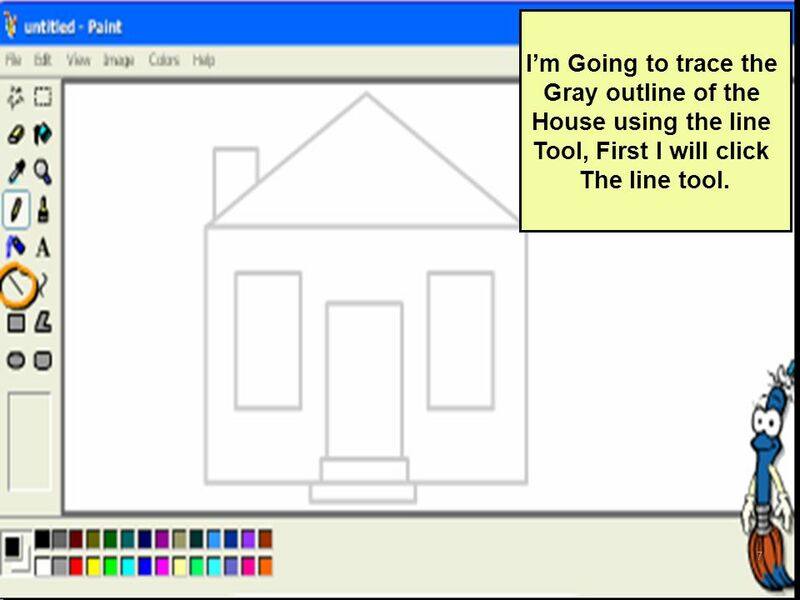 7 I’m Going to trace the Gray outline of the House using the line Tool, First I will click The line tool. 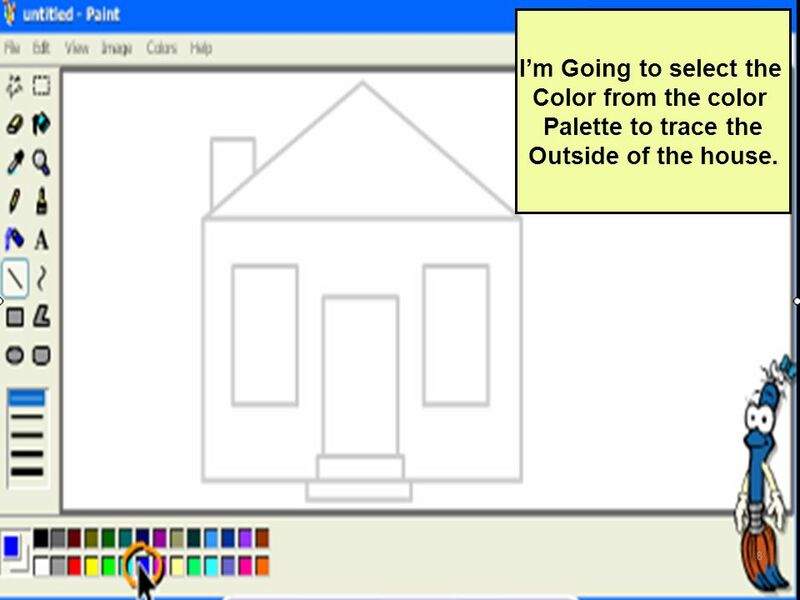 8 I’m Going to select the Color from the color Palette to trace the Outside of the house. 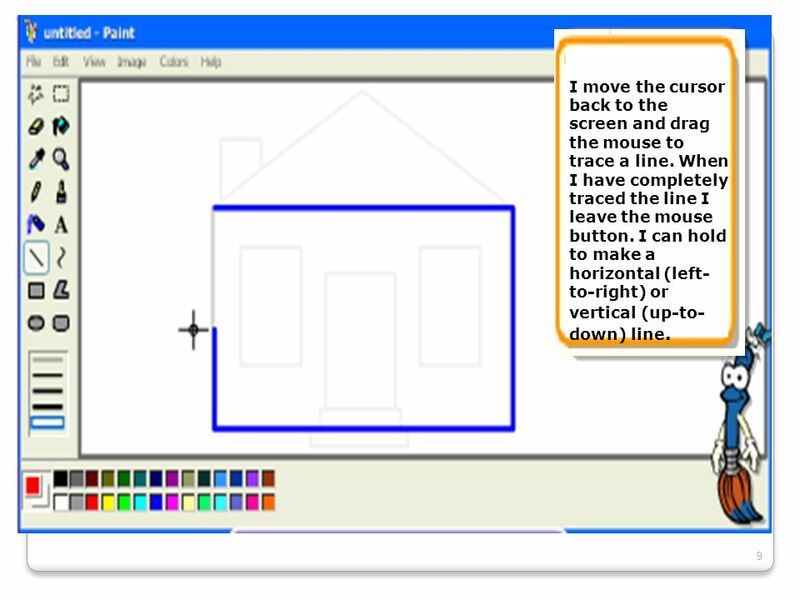 9 I move the cursor back to the screen and drag the mouse to trace a line. When I have completely traced the line I leave the mouse button. 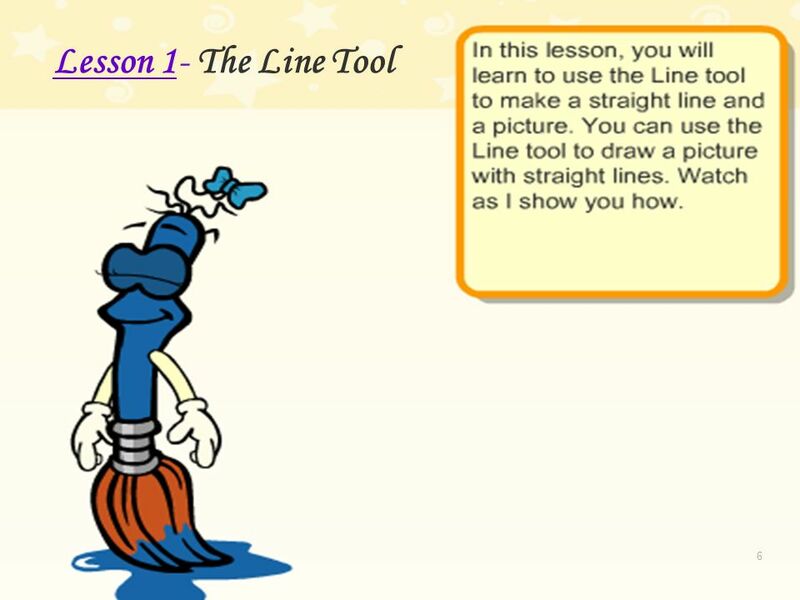 I can hold to make a horizontal (left-to-right) or vertical (up-to-down) line. 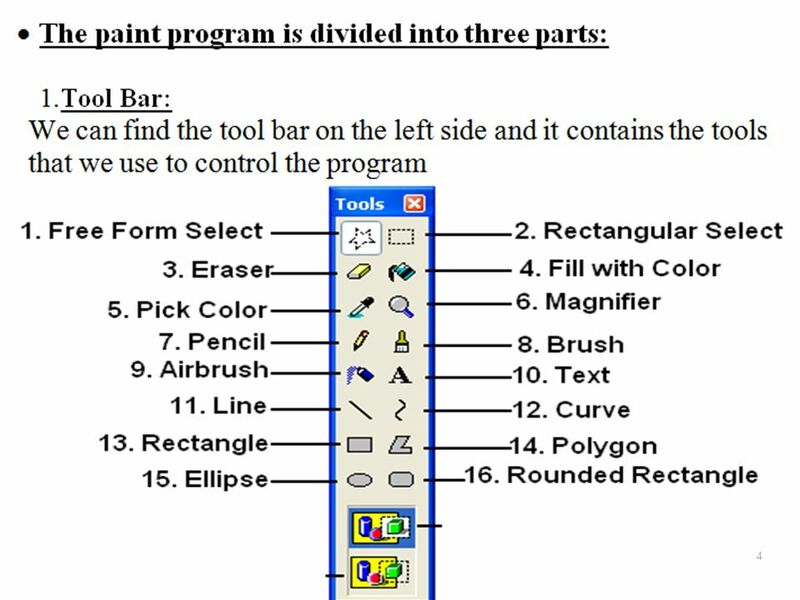 11 I’m Going to click the Pencil tool. 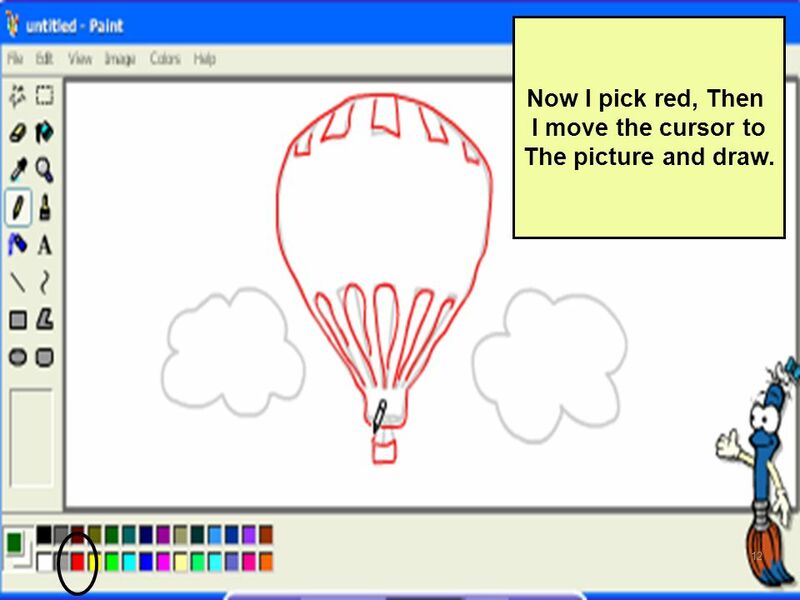 12 Now I pick red, Then I move the cursor to The picture and draw. 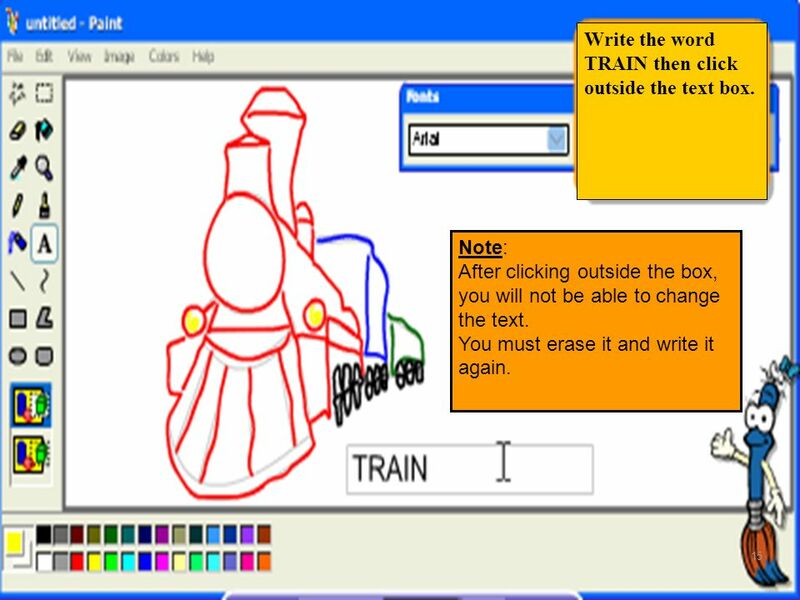 15 Write the word TRAIN then click outside the text box. 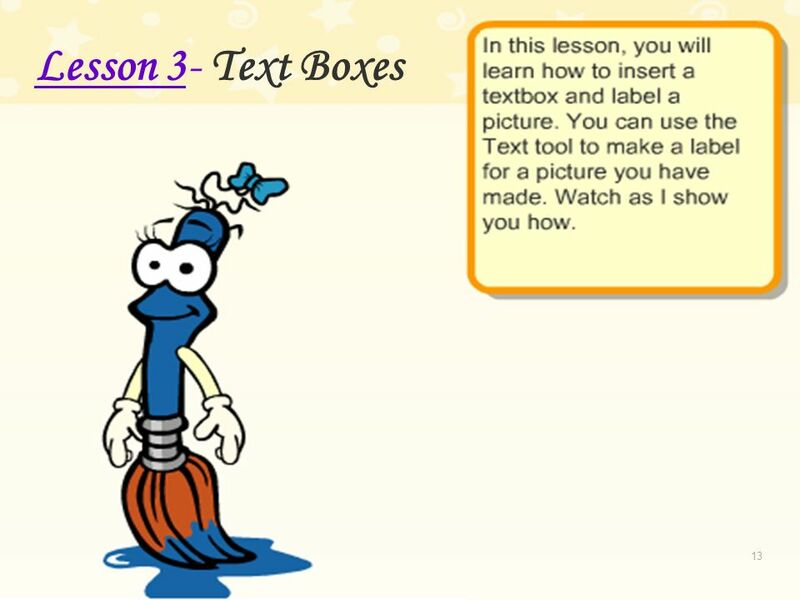 Note: After clicking outside the box, you will not be able to change the text. 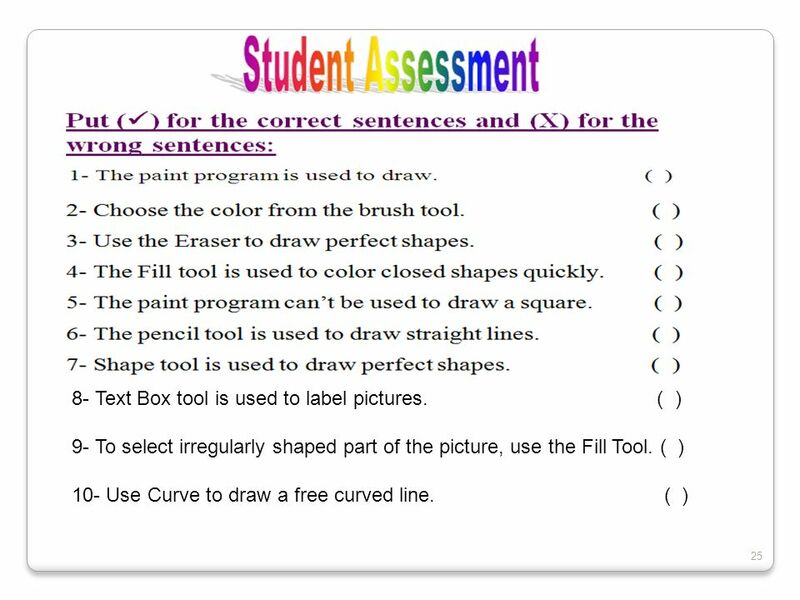 You must erase it and write it again. 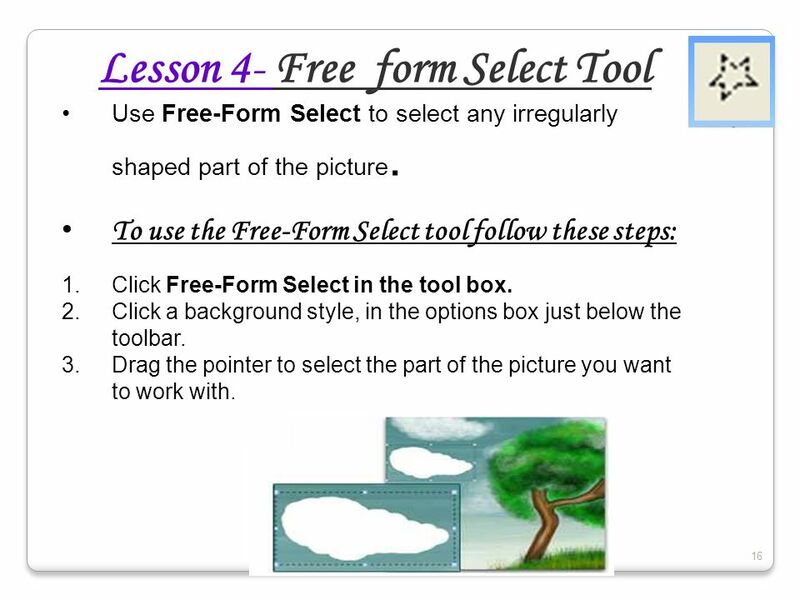 Use Free-Form Select to select any irregularly shaped part of the picture. 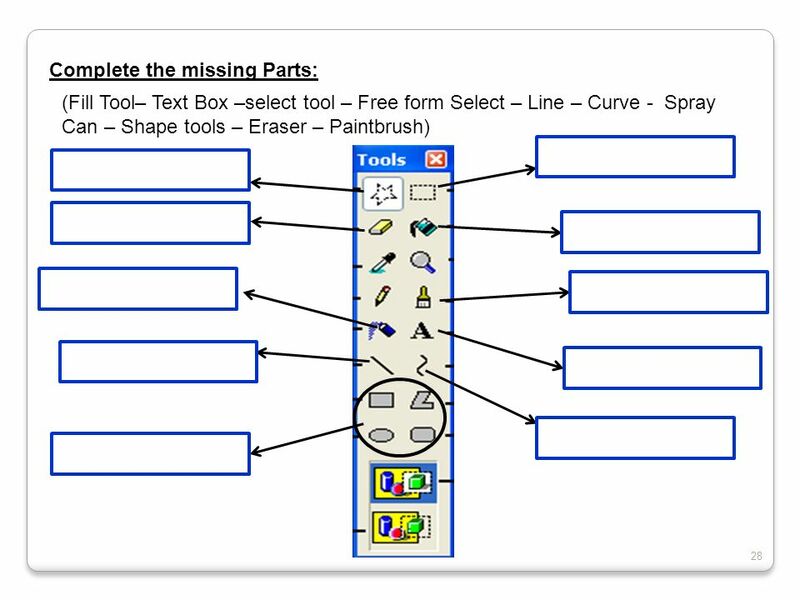 To use the Free-Form Select tool follow these steps: Click Free-Form Select in the tool box. Click a background style, in the options box just below the toolbar. 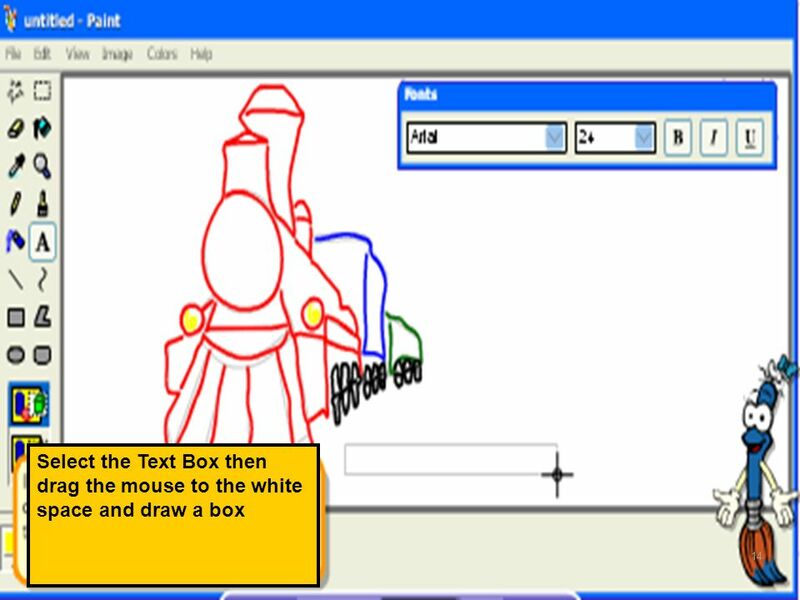 Drag the pointer to select the part of the picture you want to work with. 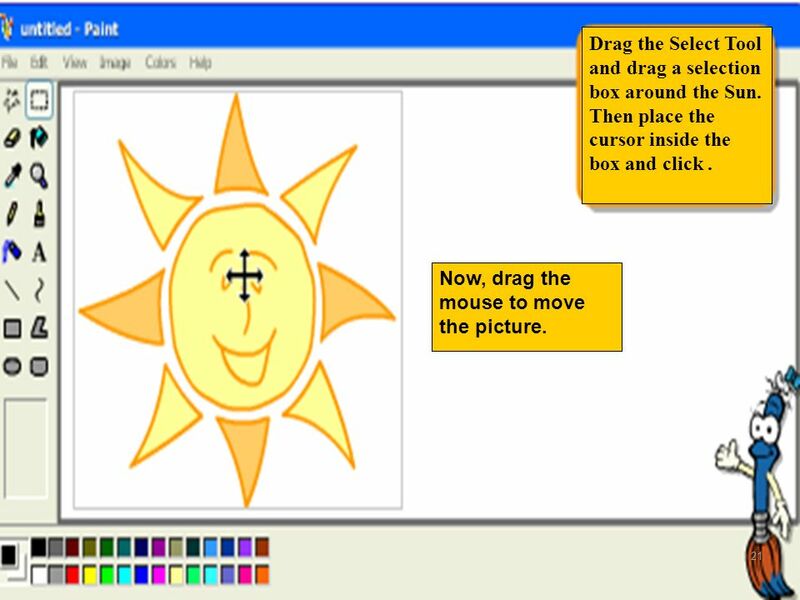 21 Drag the Select Tool and drag a selection box around the Sun. 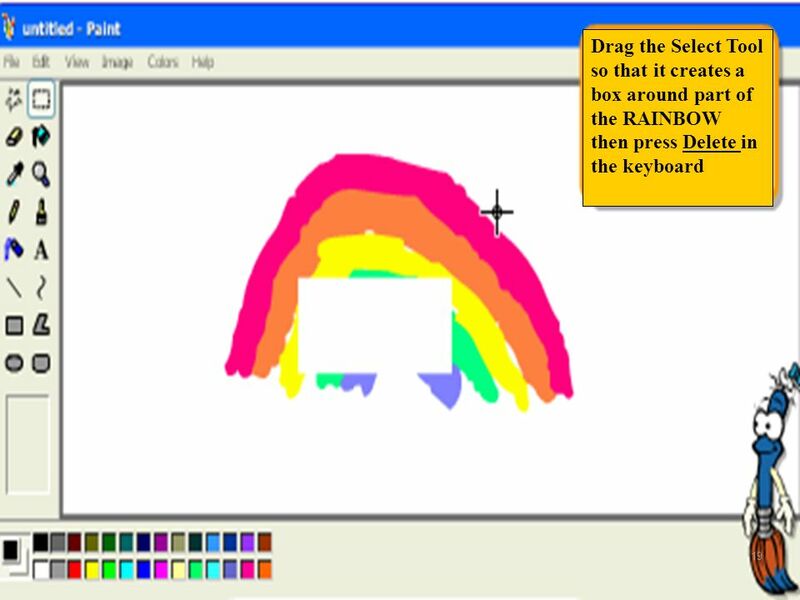 Then place the cursor inside the box and click . 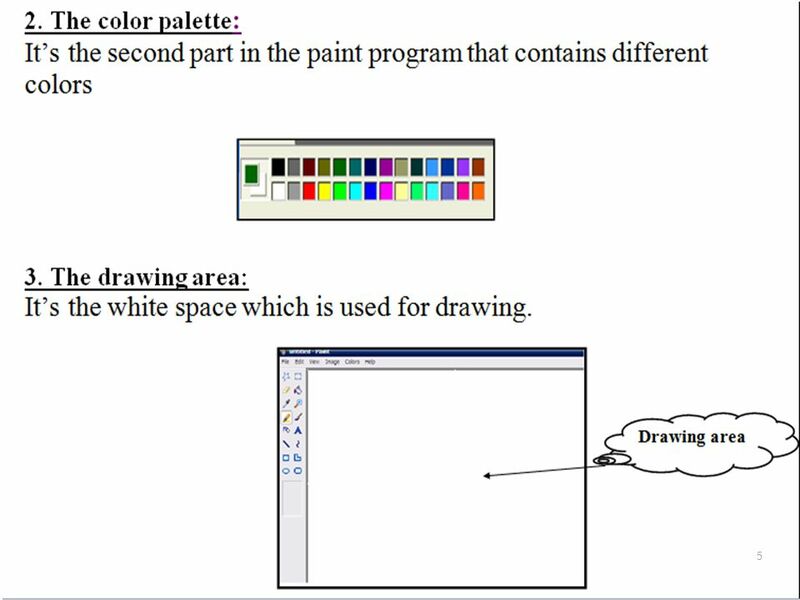 Now, drag the mouse to move the picture. 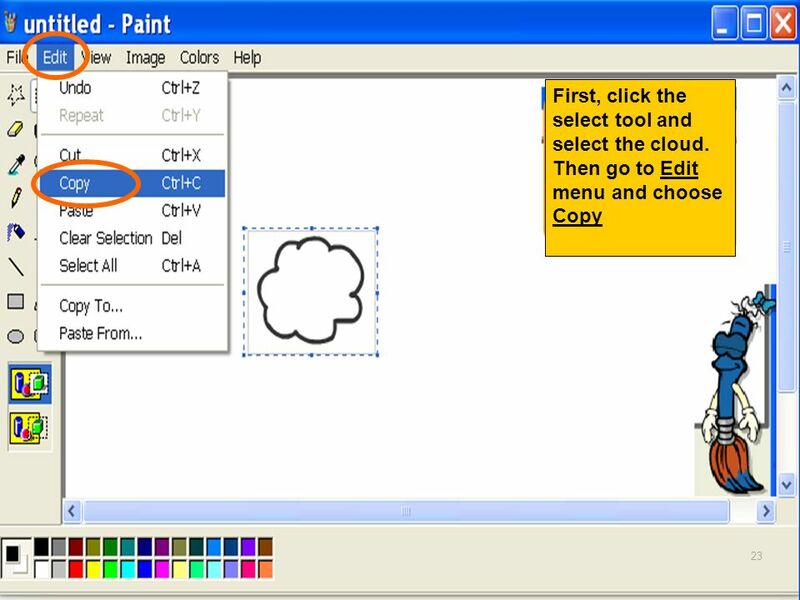 23 First, click the select tool and select the cloud. 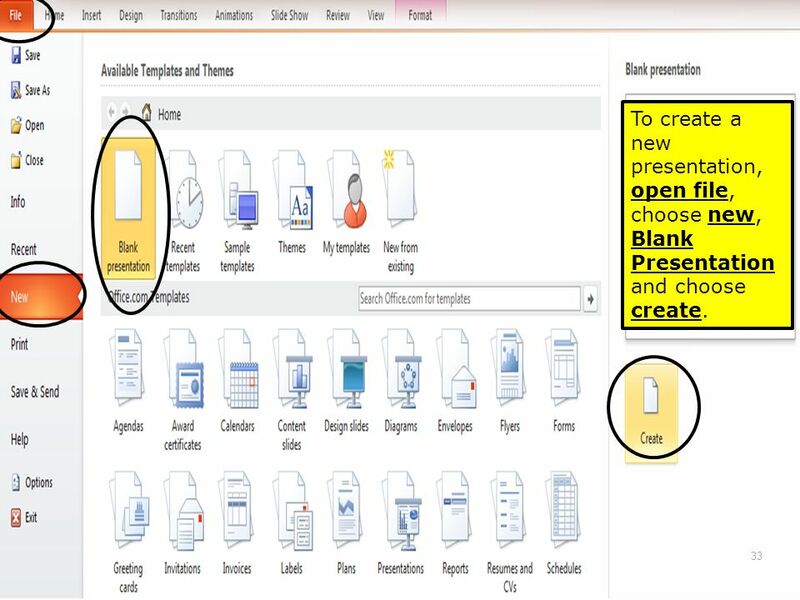 33 To create a new presentation, open file, choose new, Blank Presentation and choose create. 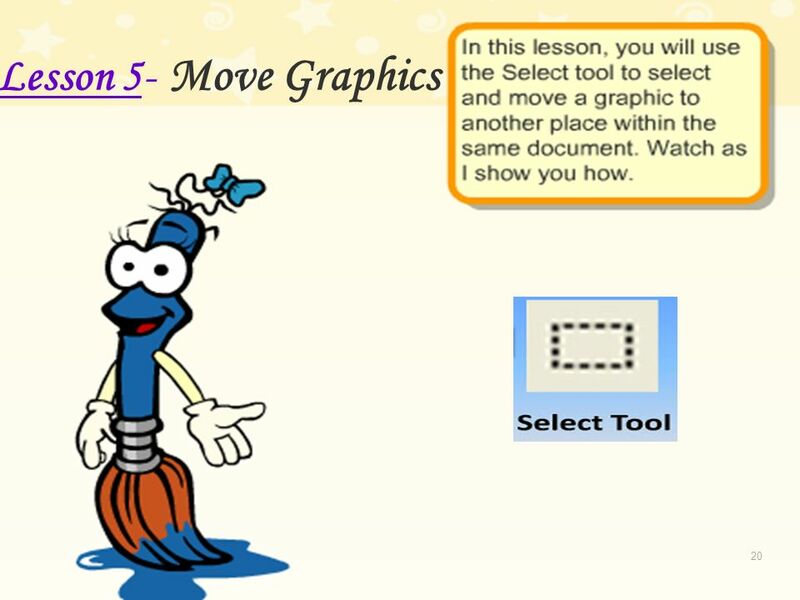 36 Lesson 2:Slide Design Use the slide Design Option to change shapes of the slides in your presentation. 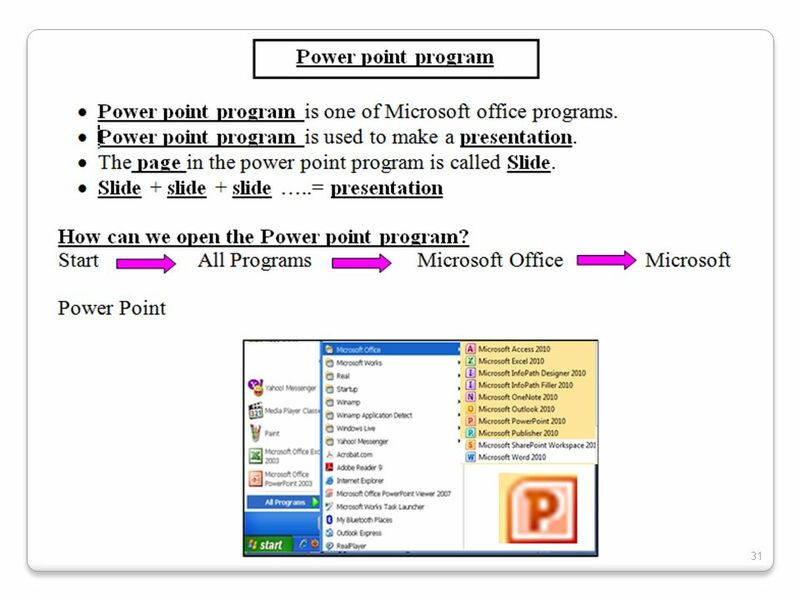 Microsoft Power Point program provides saved Templates and designs. 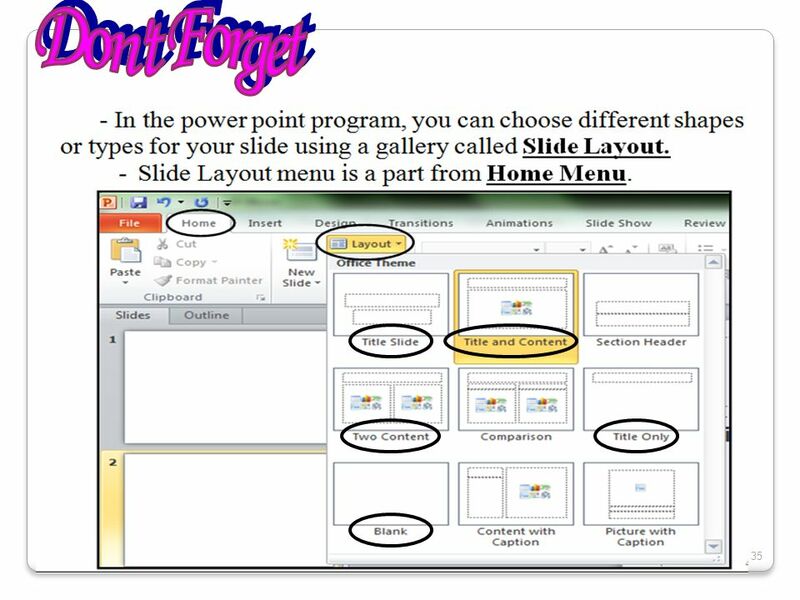 To add design to a Presentation, Follow These steps: Open Design Menu, Choose the design you like by clicking on it. 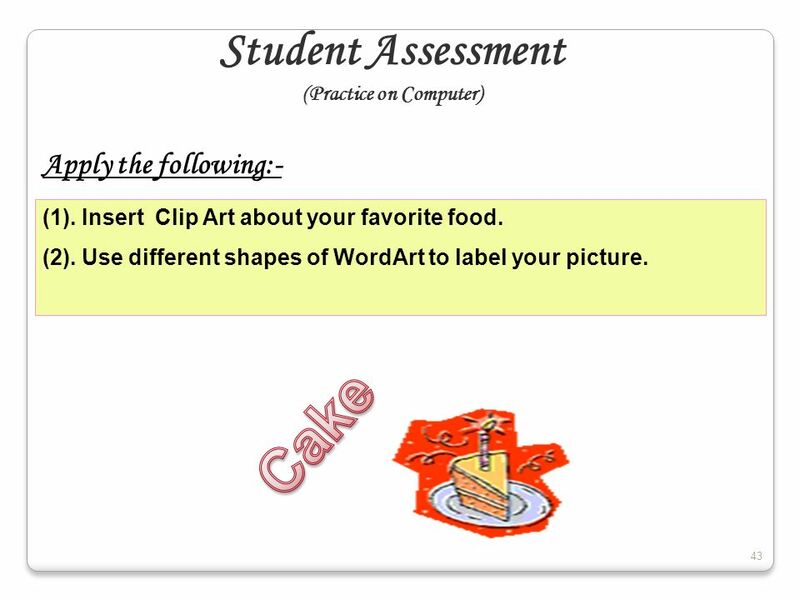 To write with different shapes or colors, Use the WordArt Gallery. 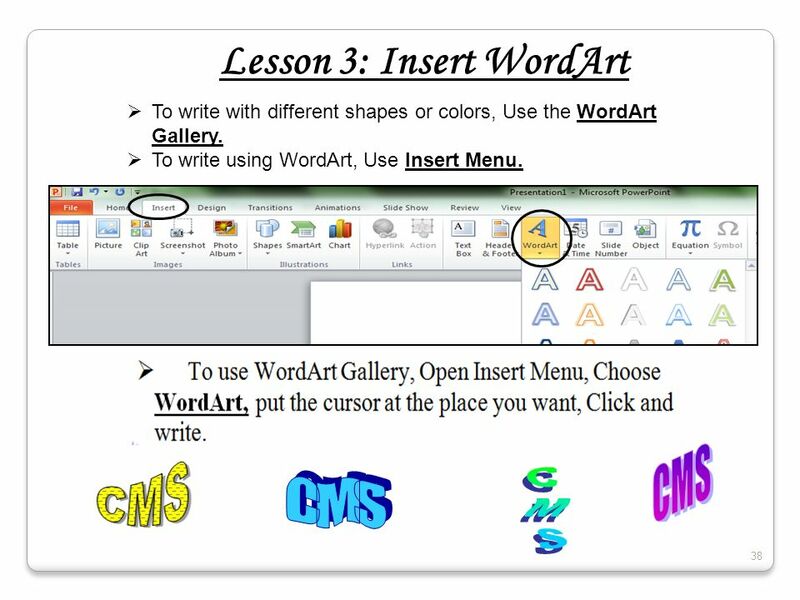 To write using WordArt, Use Insert Menu. 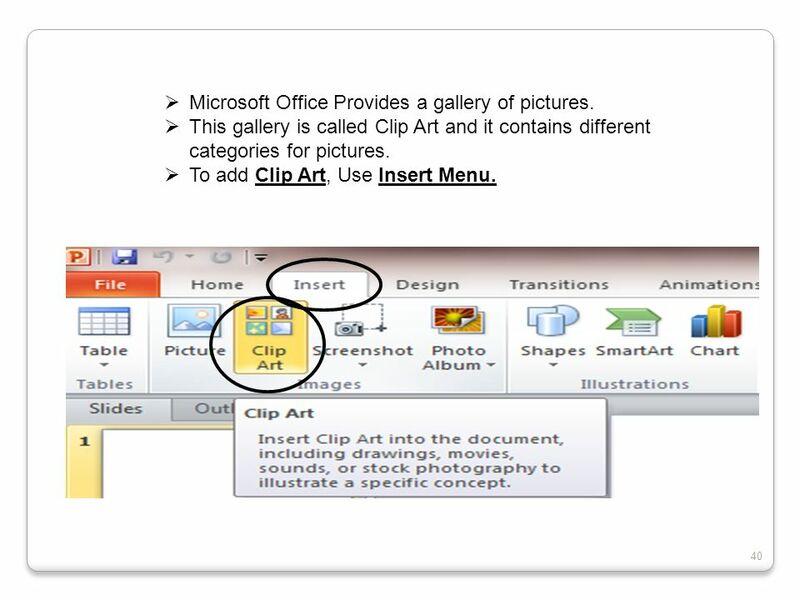 40 Microsoft Office Provides a gallery of pictures. 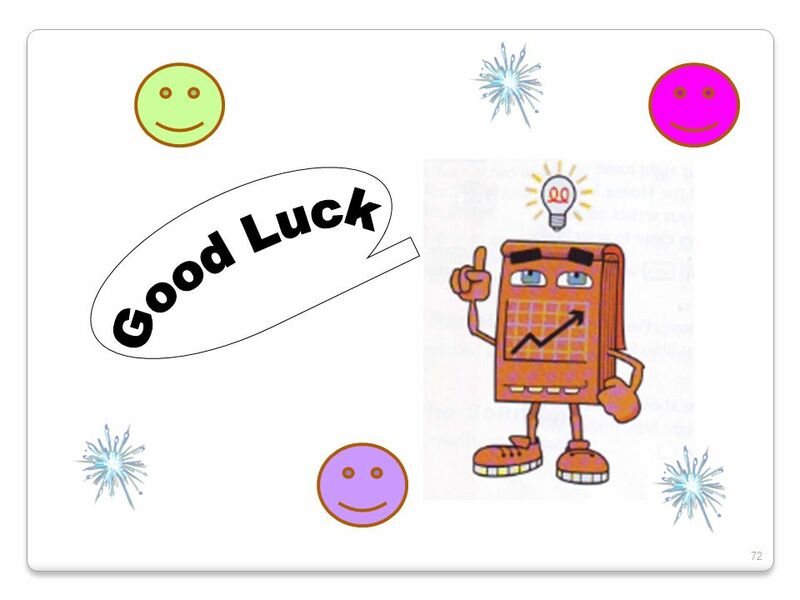 This gallery is called Clip Art and it contains different categories for pictures. 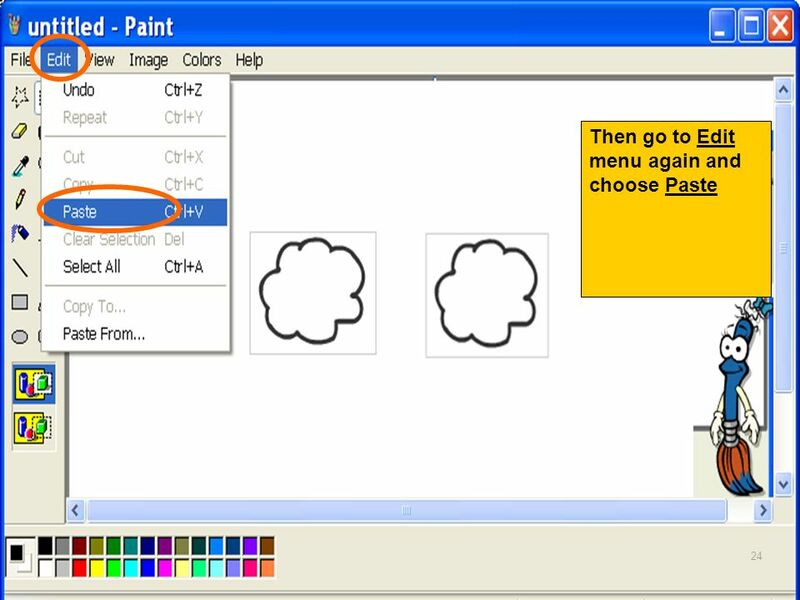 To add Clip Art, Use Insert Menu. 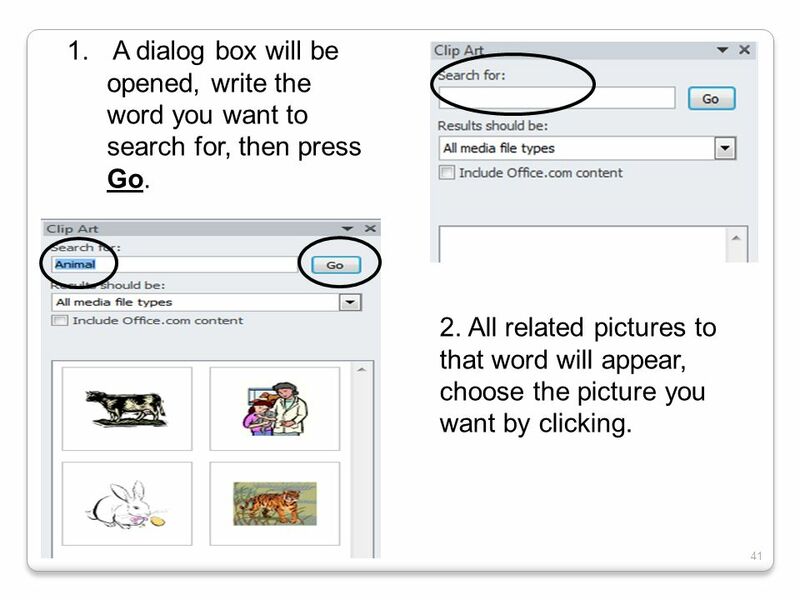 41 A dialog box will be opened, write the word you want to search for, then press Go. 2. All related pictures to that word will appear, choose the picture you want by clicking. 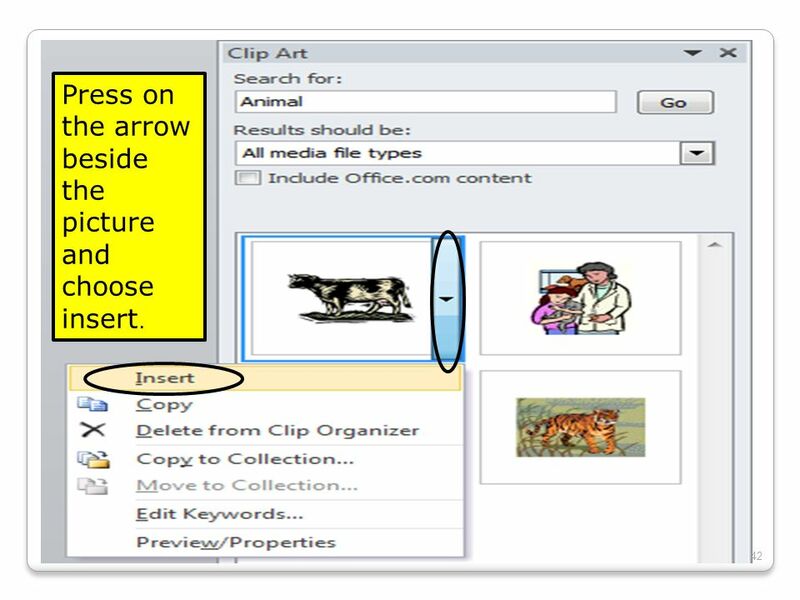 42 Press on the arrow beside the picture and choose insert. 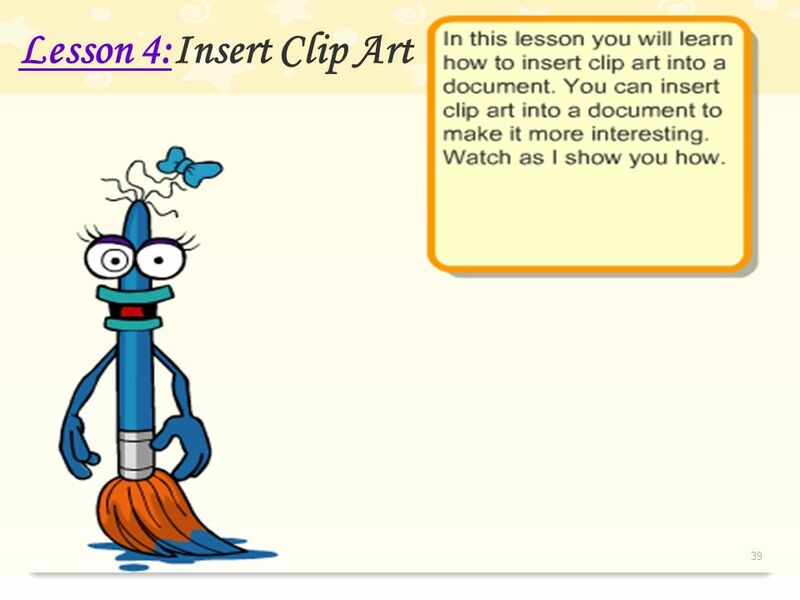 In this lesson you will learn how to cut, copy, and paste a slide. 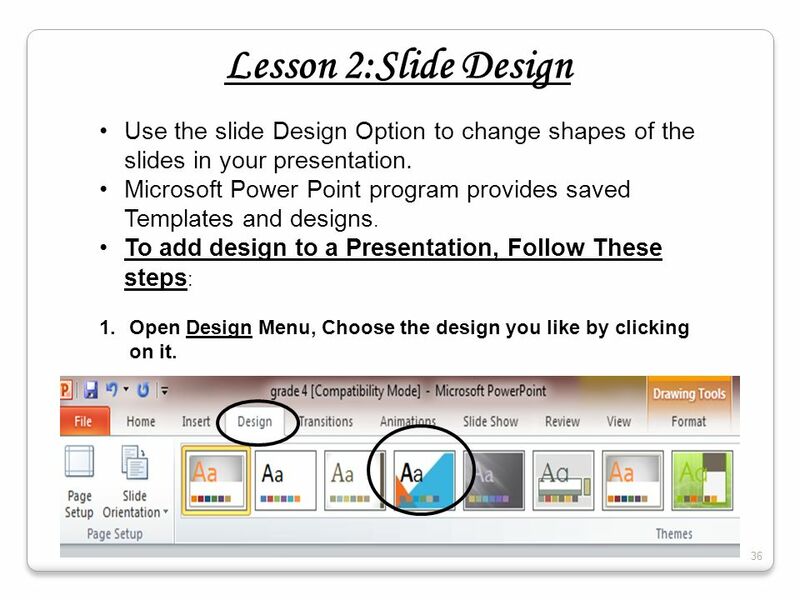 You can move slides from one place to another by using Cut and Paste. 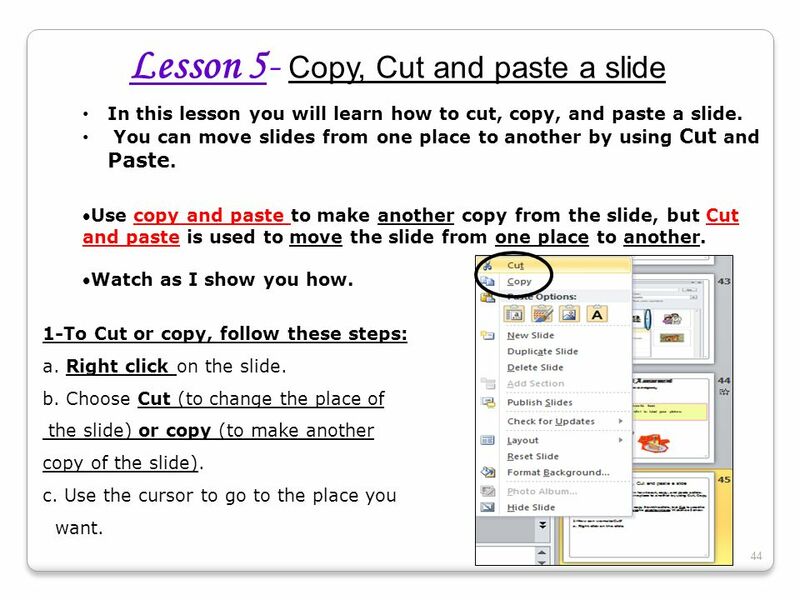 Use copy and paste to make another copy from the slide, but Cut and paste is used to move the slide from one place to another. Watch as I show you how. 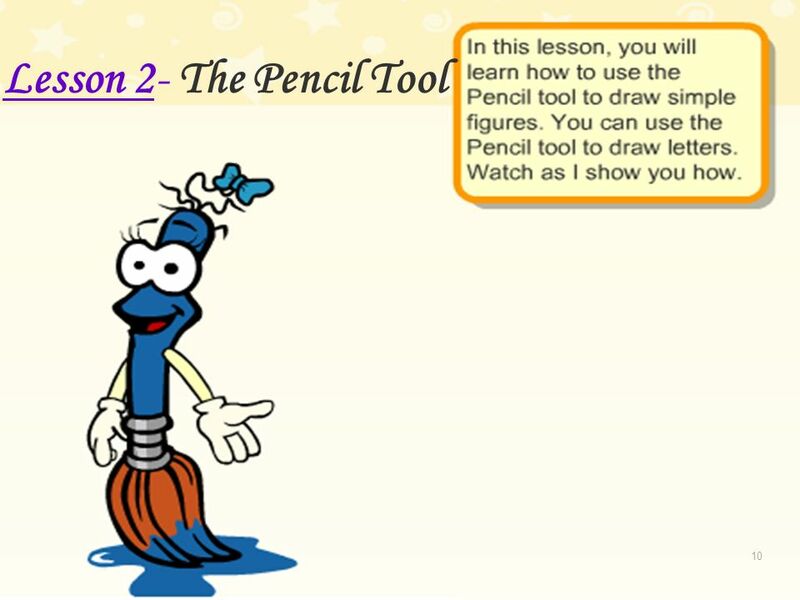 1-To Cut or copy, follow these steps: a. 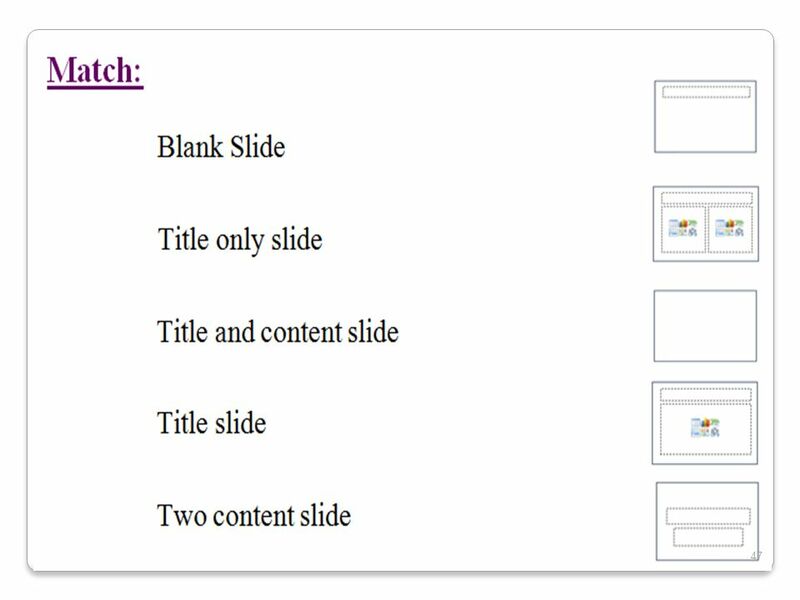 Right click on the slide. b. 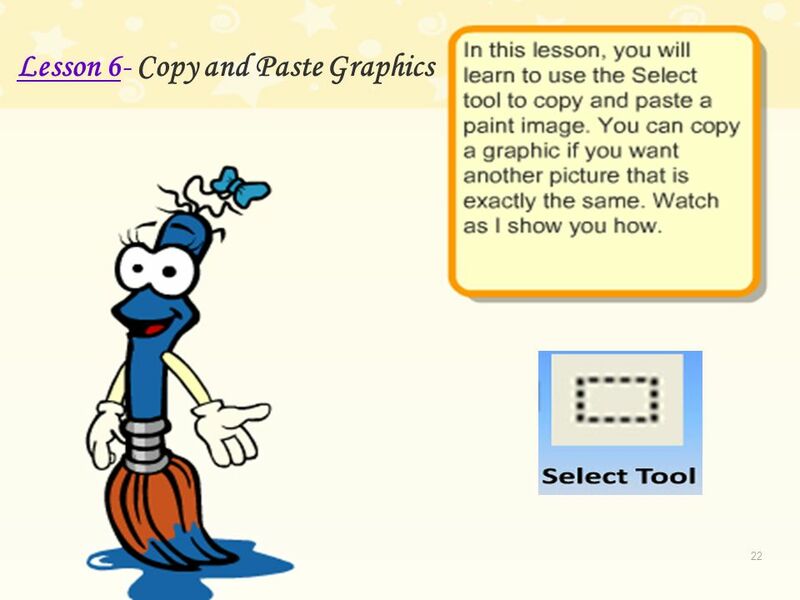 Choose Cut (to change the place of the slide) or copy (to make another copy of the slide). 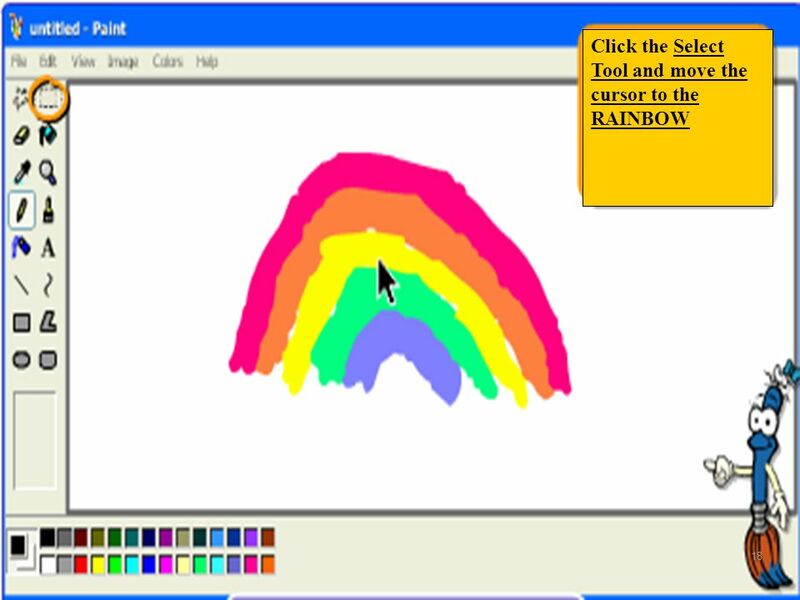 c. Use the cursor to go to the place you want. 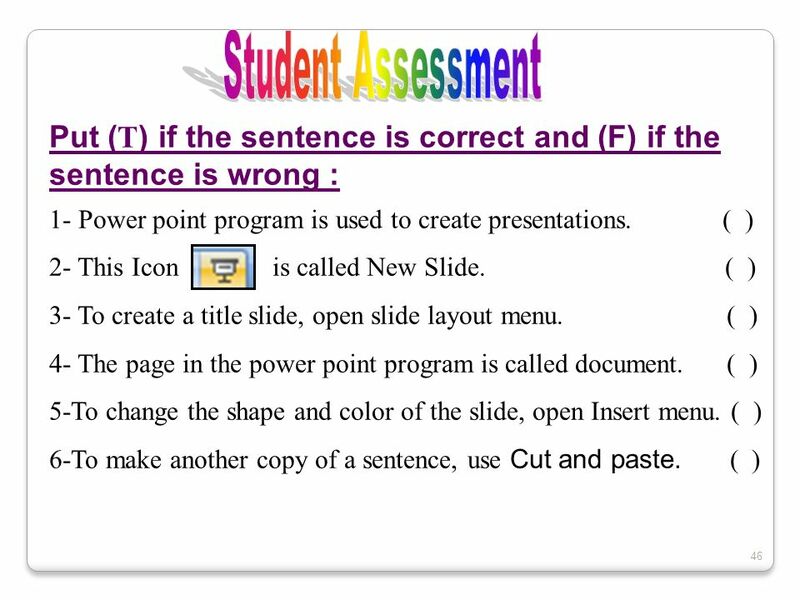 45 Choose this option to paste the slide with the same format. Right click. Choose paste options. 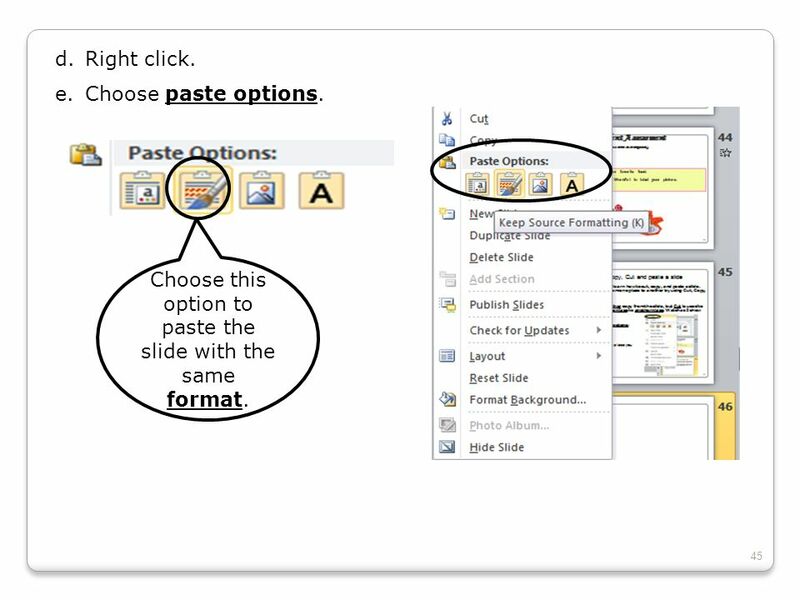 Choose this option to paste the slide with the same format. 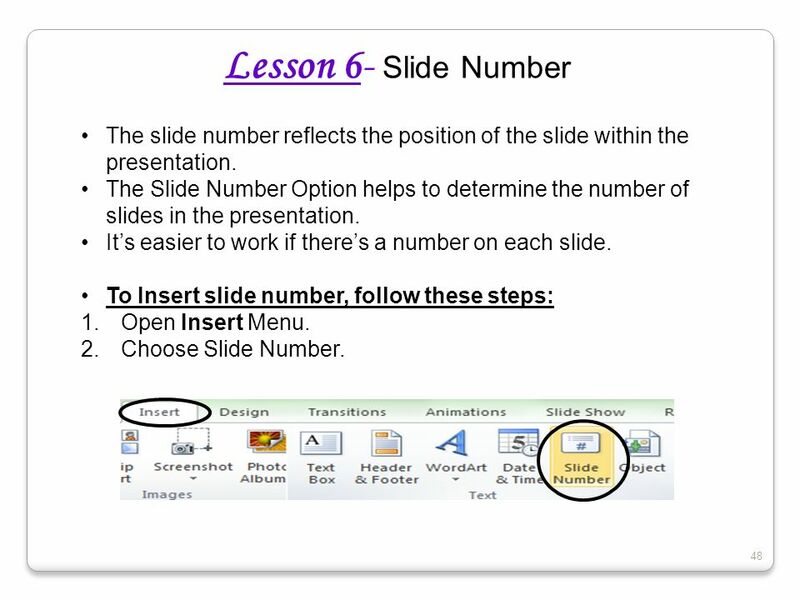 48 Lesson 6- Slide Number The slide number reflects the position of the slide within the presentation. 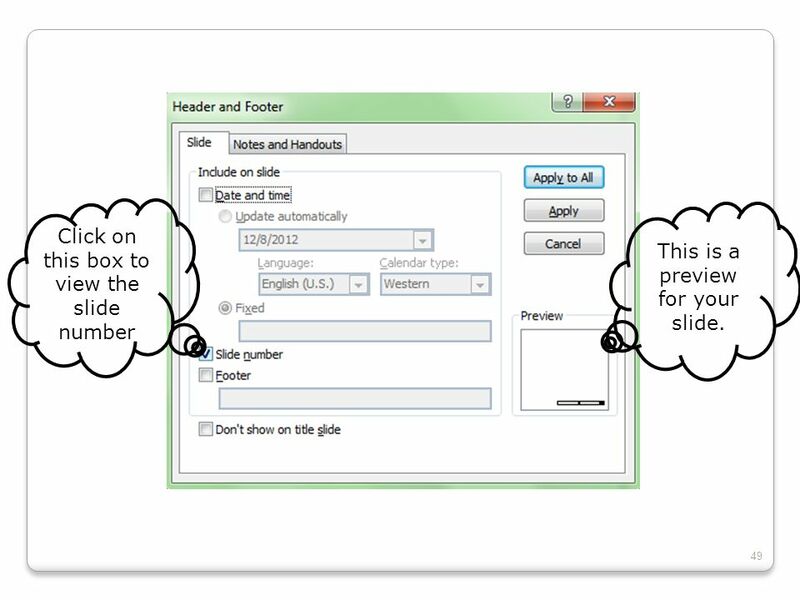 The Slide Number Option helps to determine the number of slides in the presentation. It’s easier to work if there’s a number on each slide. 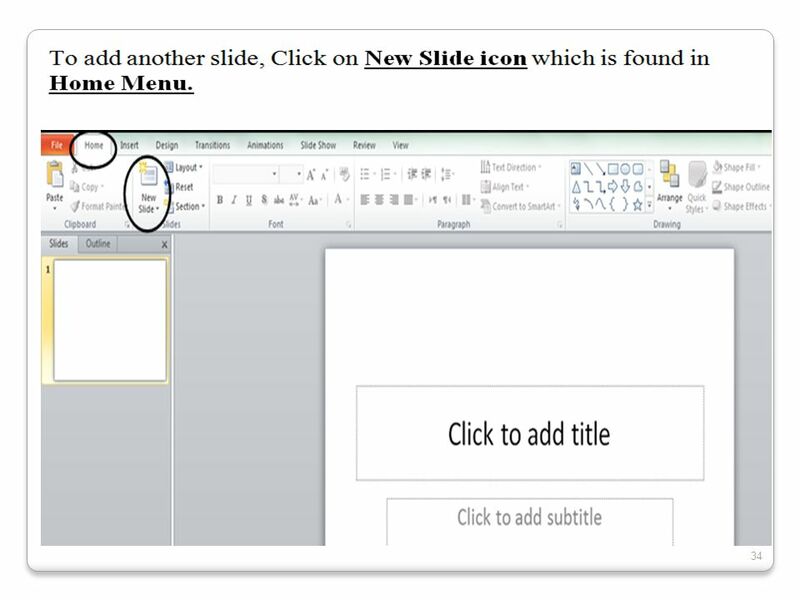 To Insert slide number, follow these steps: Open Insert Menu. Choose Slide Number. 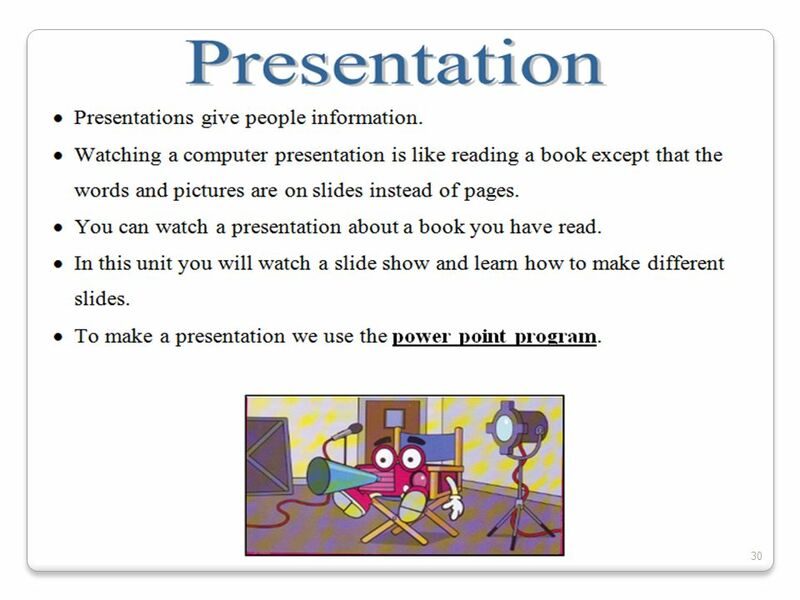 This is a preview for your slide. 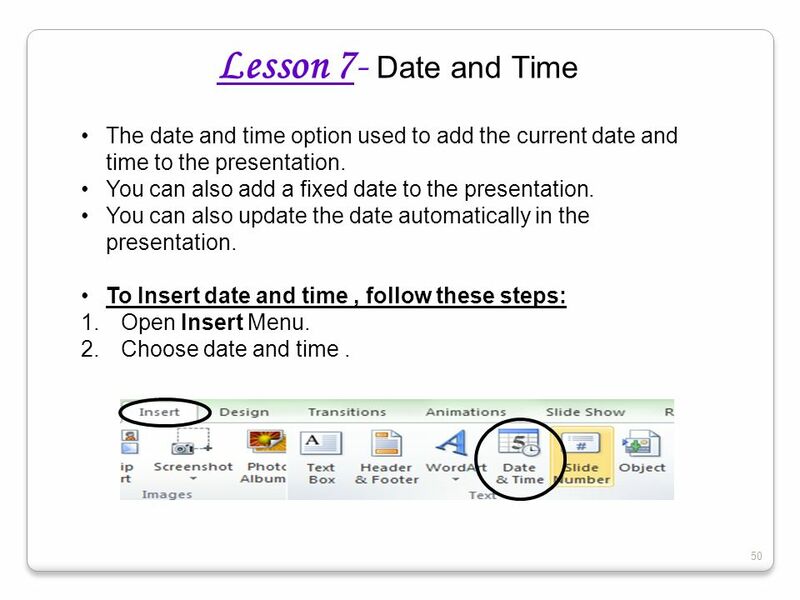 50 Lesson 7- Date and Time The date and time option used to add the current date and time to the presentation. 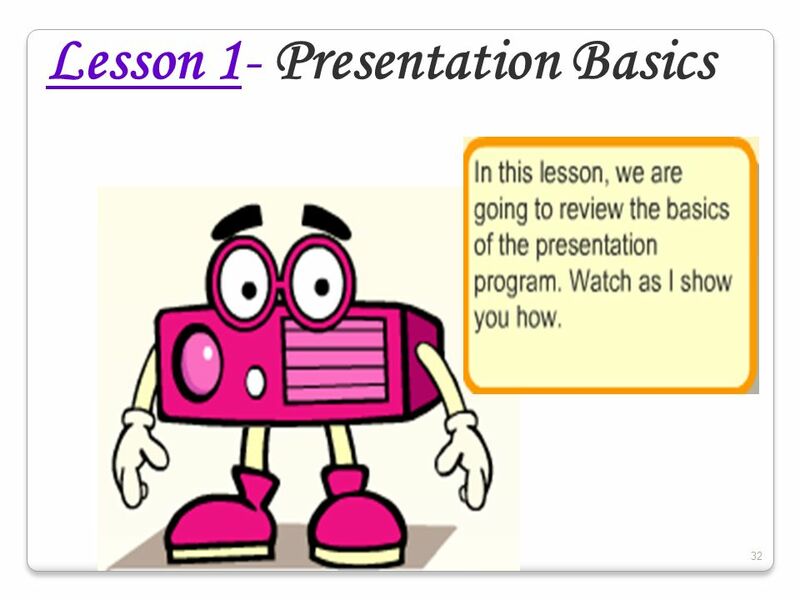 You can also add a fixed date to the presentation. 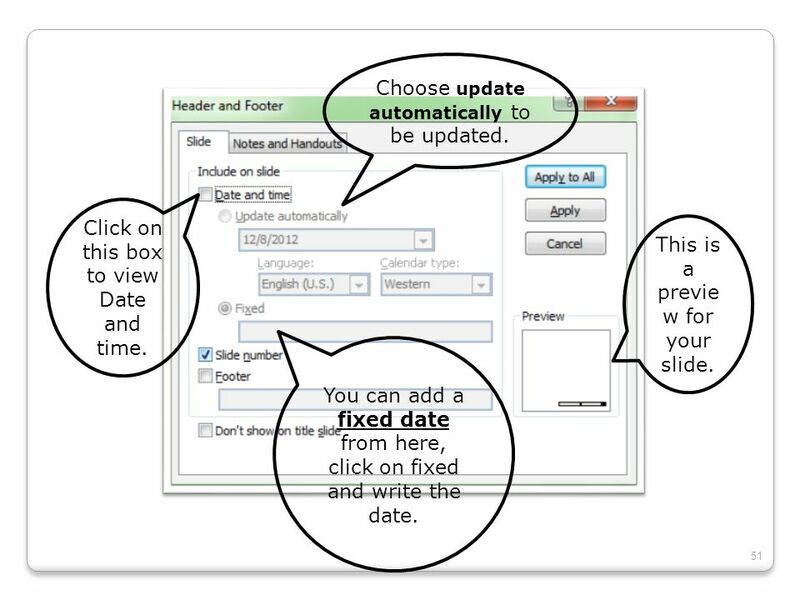 You can also update the date automatically in the presentation. To Insert date and time , follow these steps: Open Insert Menu. Choose date and time . 51 Choose update automatically to be updated. Click on this box to view Date and time. 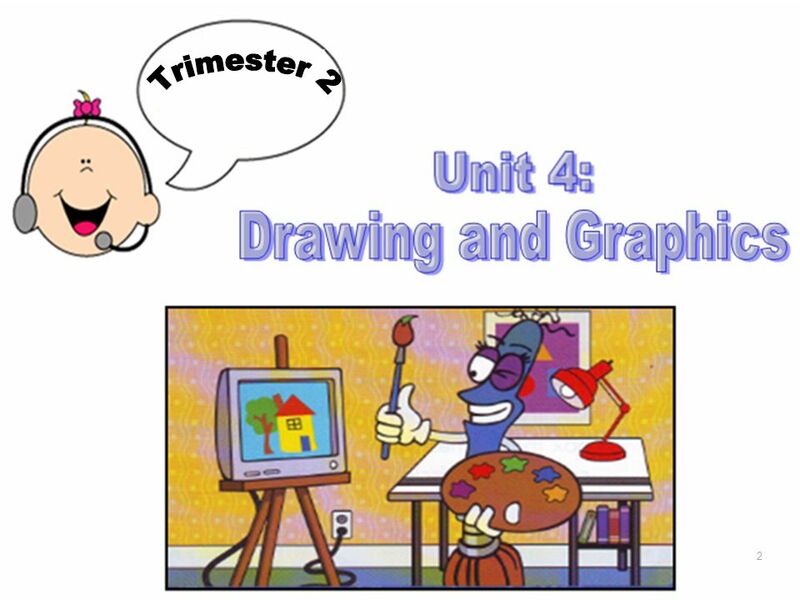 This is a preview for your slide. You can add a fixed date from here, click on fixed and write the date. 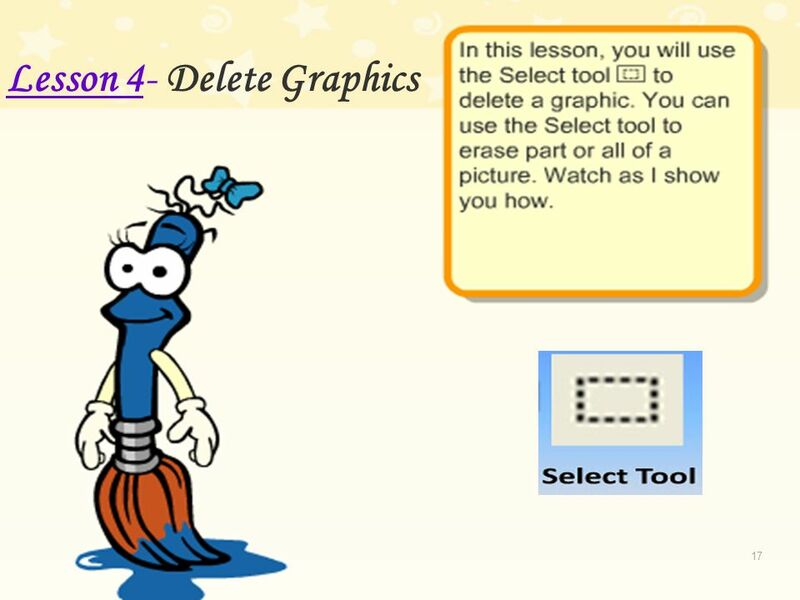 52 Lesson 8- Delete a slide Delete a slide means to erase it. 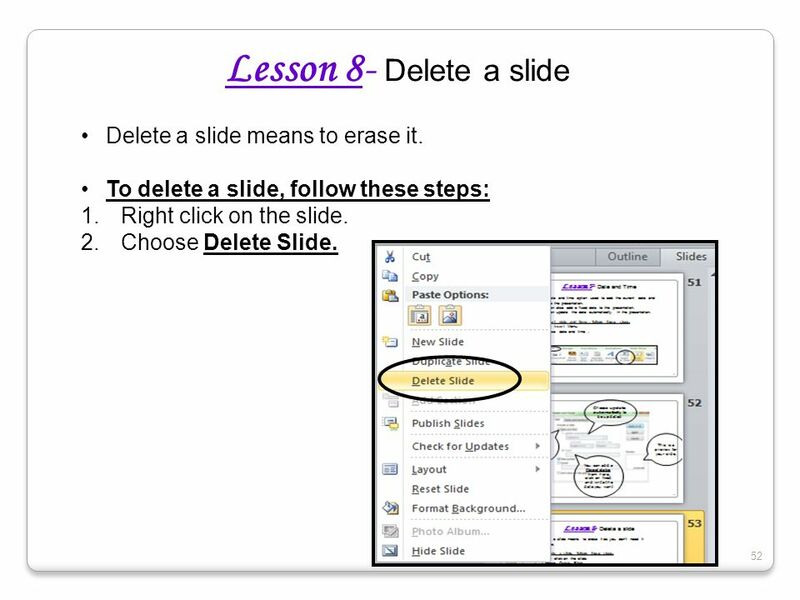 To delete a slide, follow these steps: Right click on the slide. Choose Delete Slide. 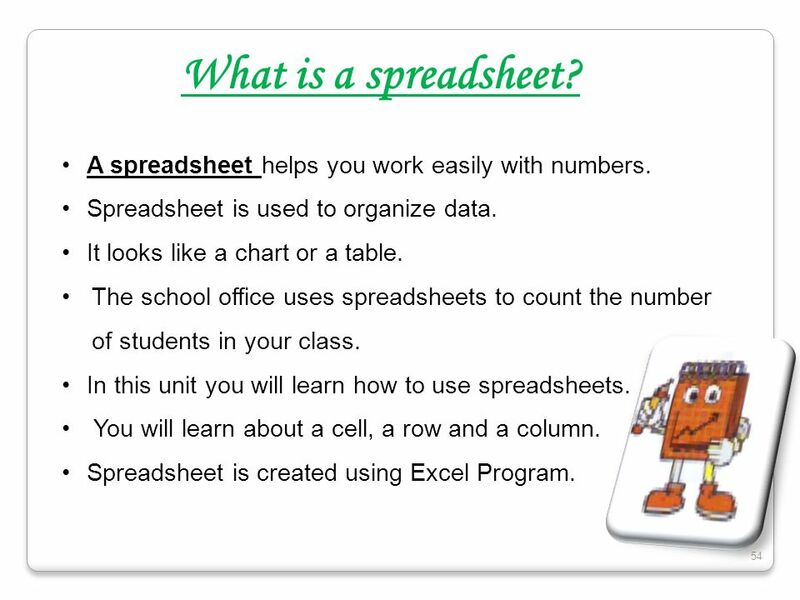 54 What is a spreadsheet? 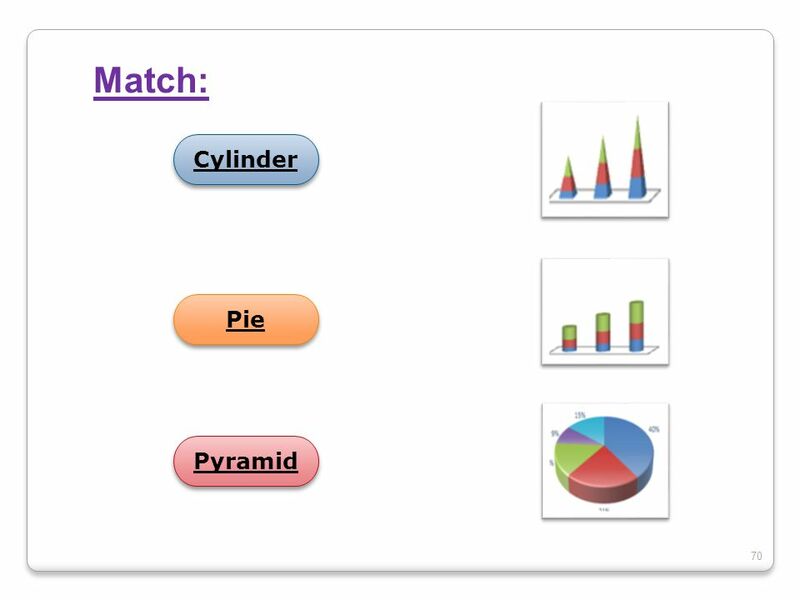 A spreadsheet helps you work easily with numbers. 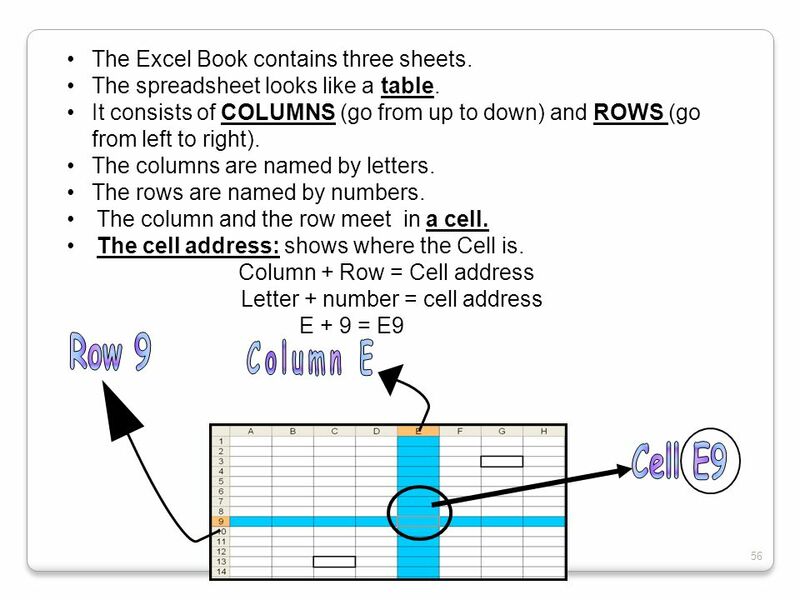 Spreadsheet is used to organize data. It looks like a chart or a table. 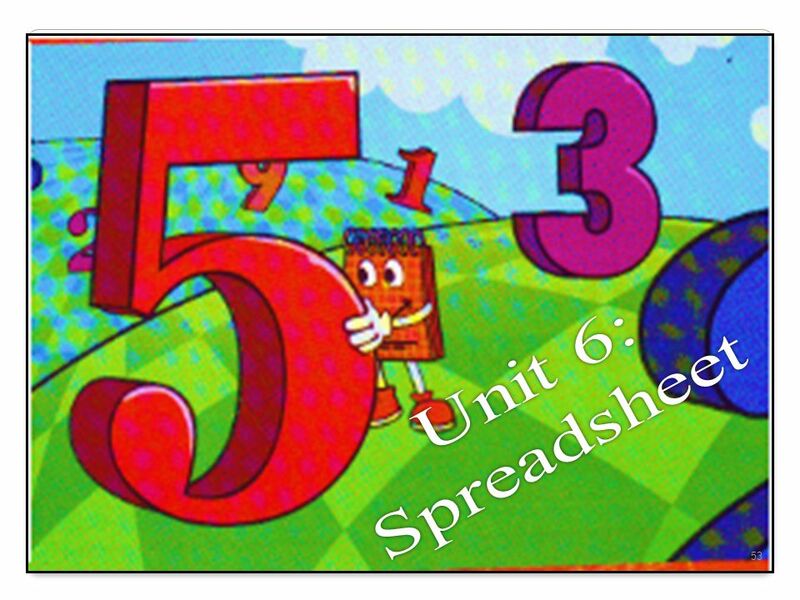 The school office uses spreadsheets to count the number of students in your class. 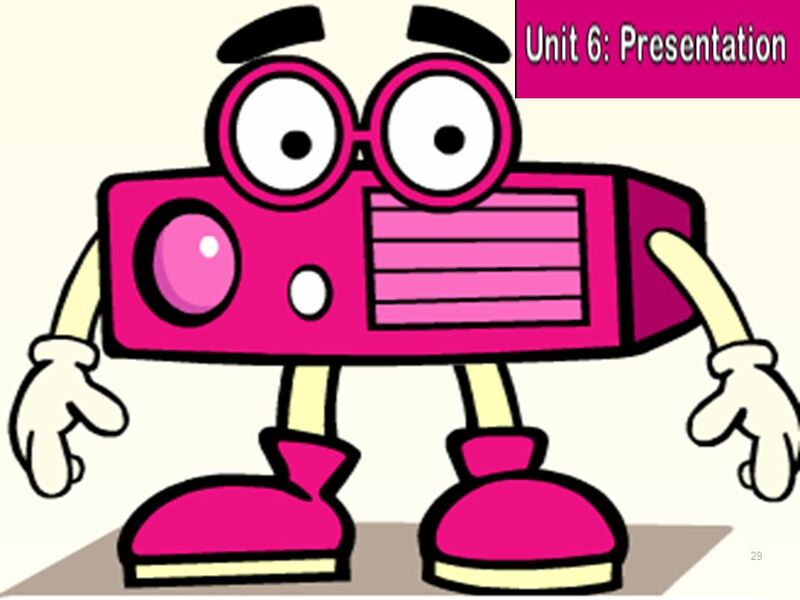 In this unit you will learn how to use spreadsheets. 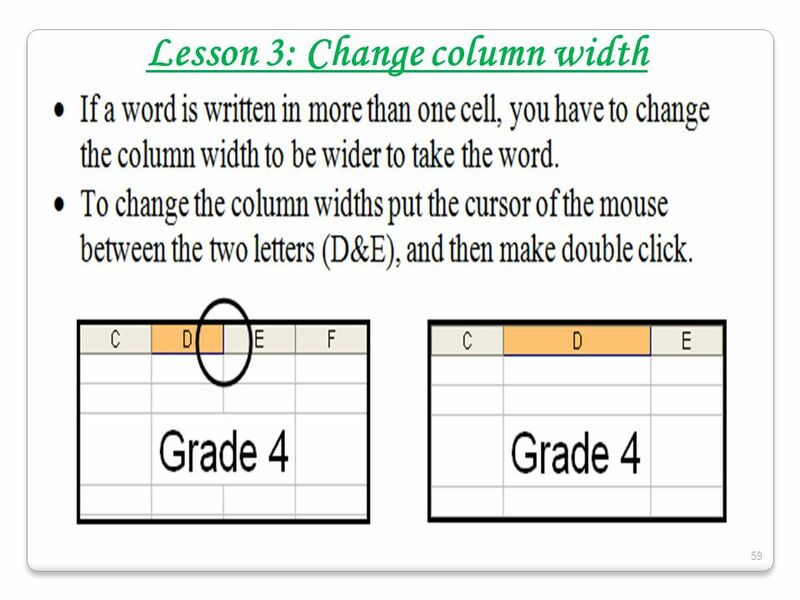 You will learn about a cell, a row and a column. 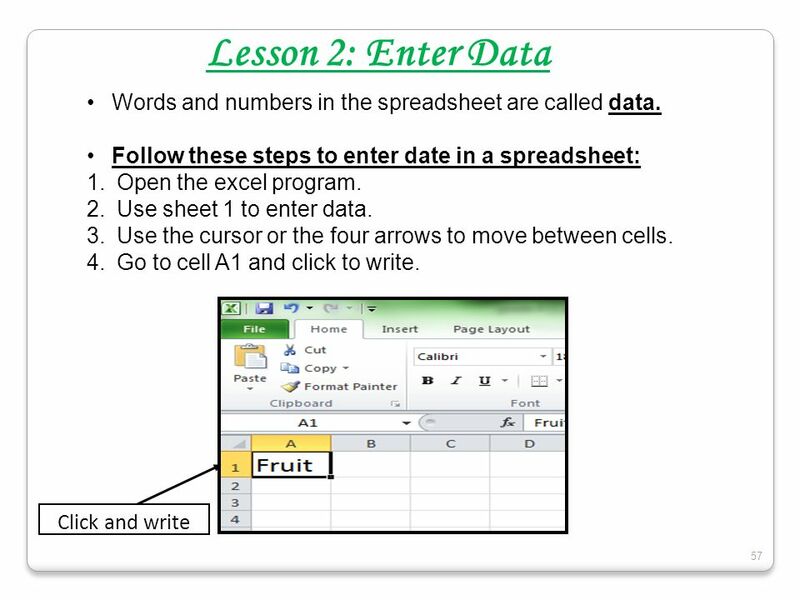 Spreadsheet is created using Excel Program. 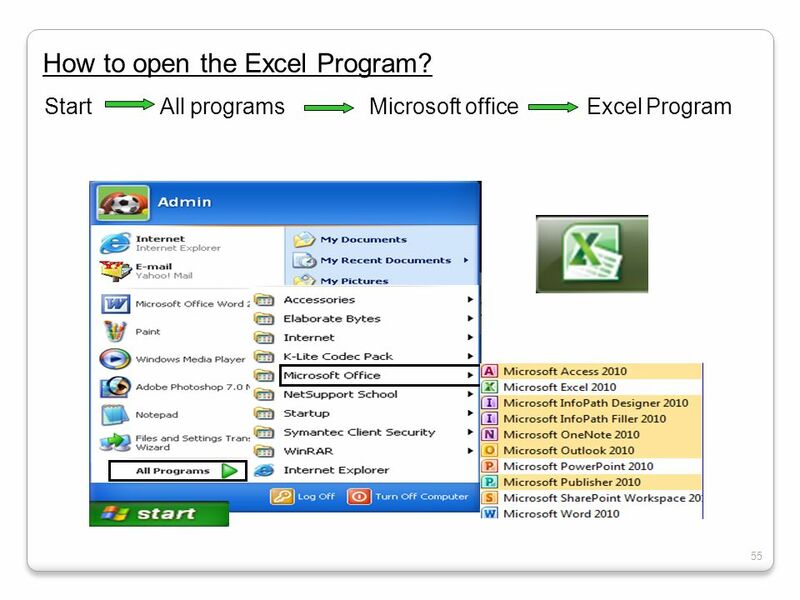 55 How to open the Excel Program? 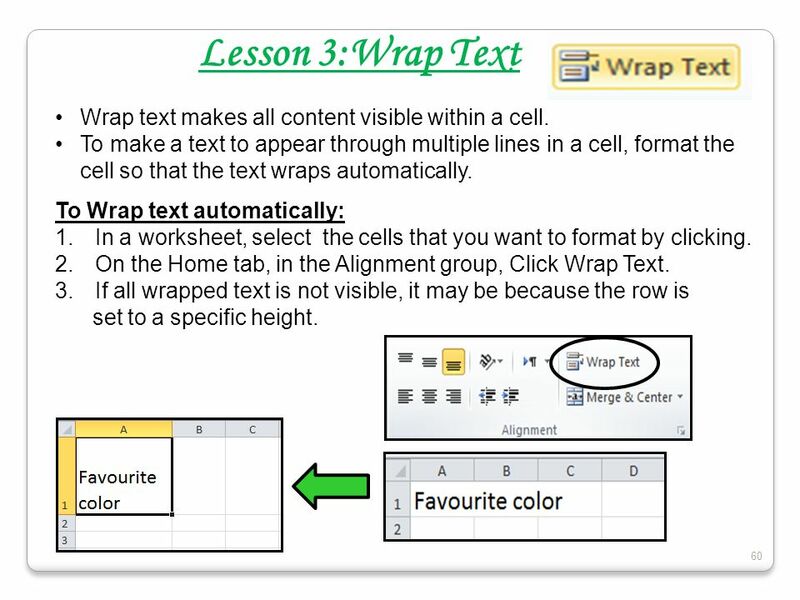 60 Lesson 3:Wrap Text Wrap text makes all content visible within a cell. 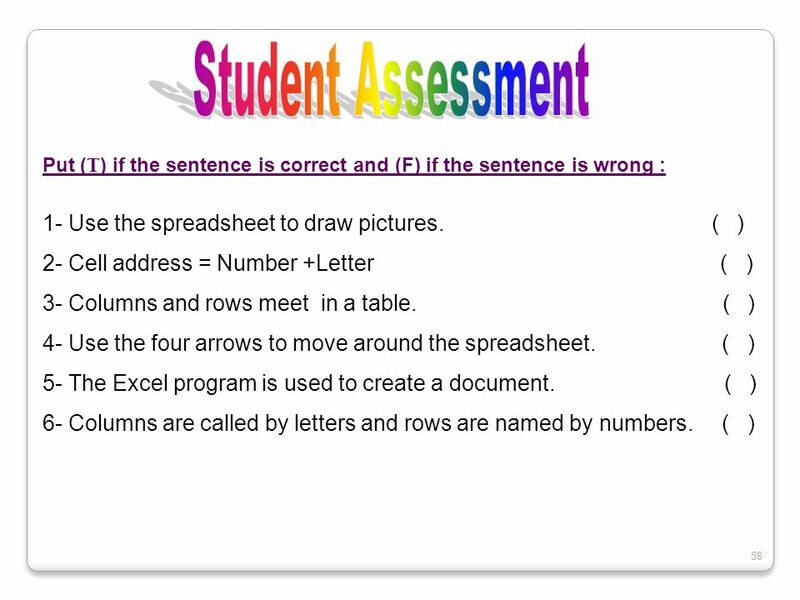 To make a text to appear through multiple lines in a cell, format the cell so that the text wraps automatically. 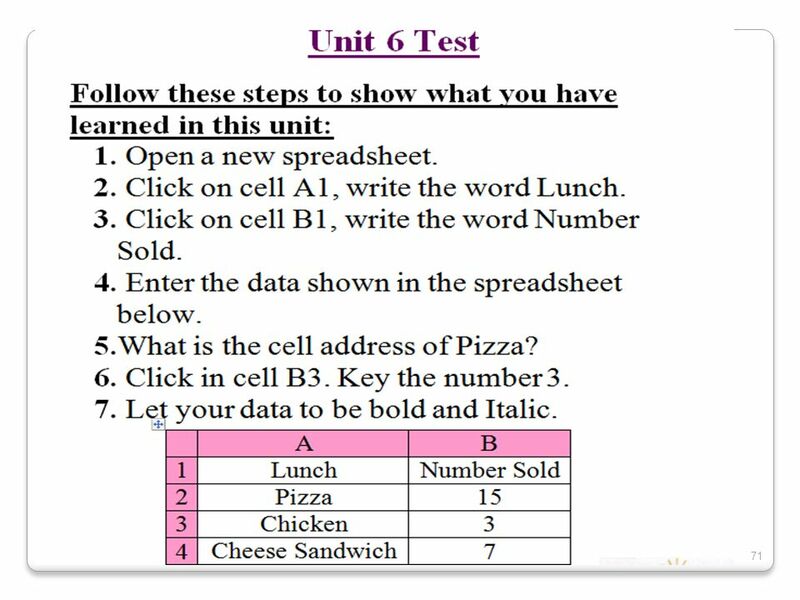 To Wrap text automatically: In a worksheet, select the cells that you want to format by clicking. On the Home tab, in the Alignment group, Click Wrap Text. If all wrapped text is not visible, it may be because the row is set to a specific height. 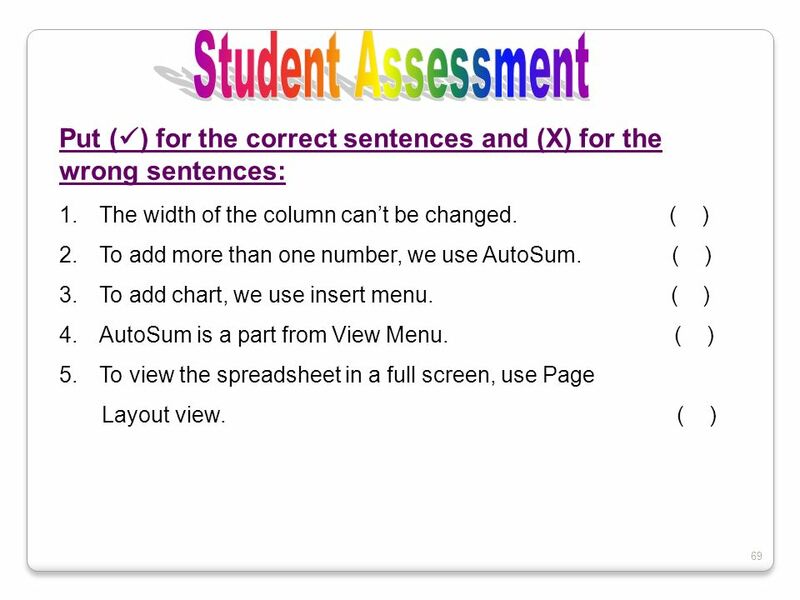 We can use the AutoSum icon to add two or more numbers easily. It displays the sum of the selected cells directly after the selected cells. 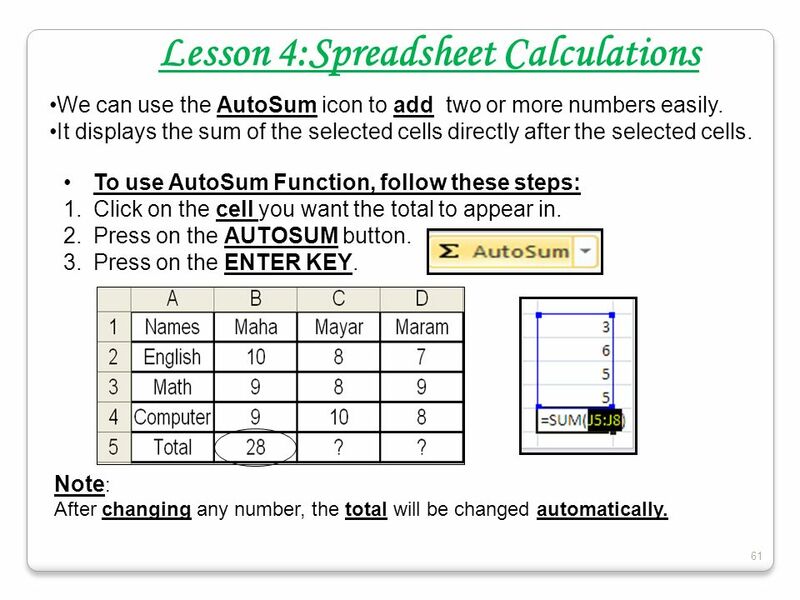 To use AutoSum Function, follow these steps: Click on the cell you want the total to appear in. Press on the AUTOSUM button. Press on the ENTER KEY. Note: After changing any number, the total will be changed automatically. 1-Full Screen View: It’s used to see the spreadsheet in a full screen mode to be clearer. No toolbars appear in Full screen view. To return to the normal view, press Esc key in the keyboard. 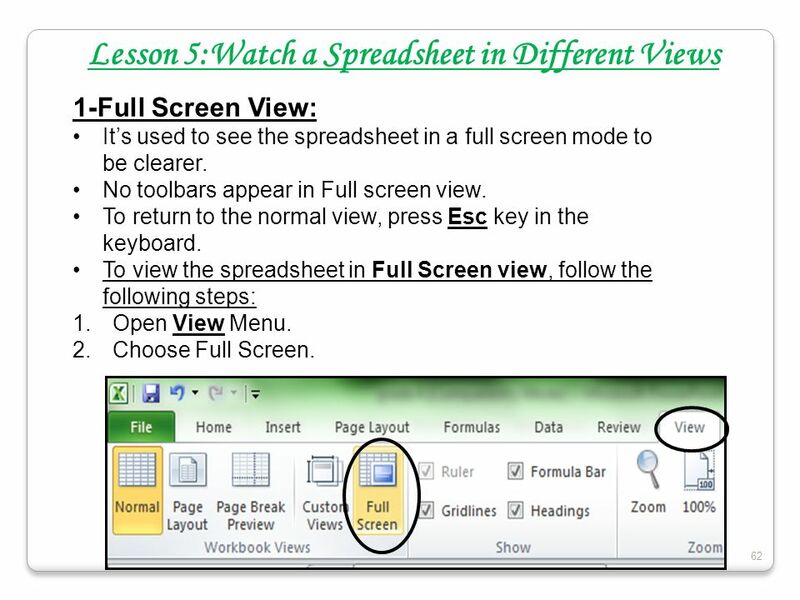 To view the spreadsheet in Full Screen view, follow the following steps: Open View Menu. Choose Full Screen. 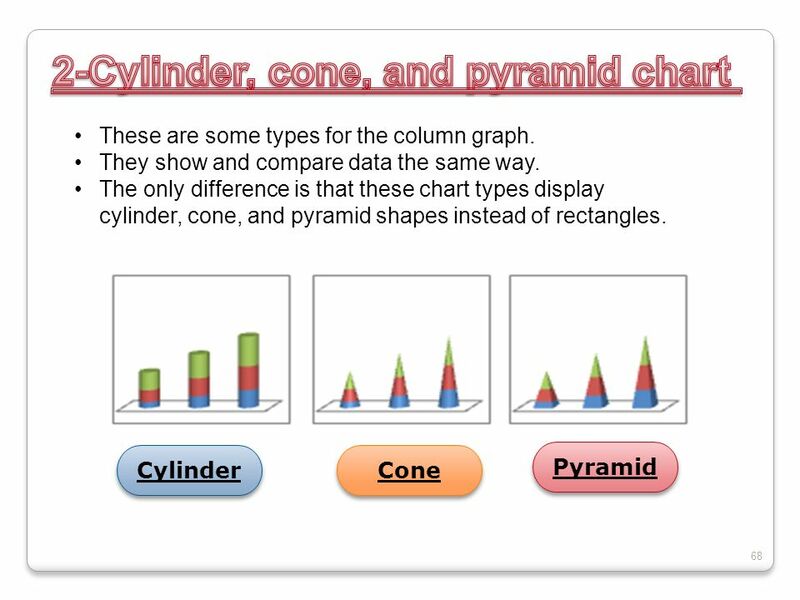 63 2-Page Layout View: It’s used to view the spreadsheet as it will appear on the printed page. Use this view to see where pages begin and end, and to view any headers and footers on the page. 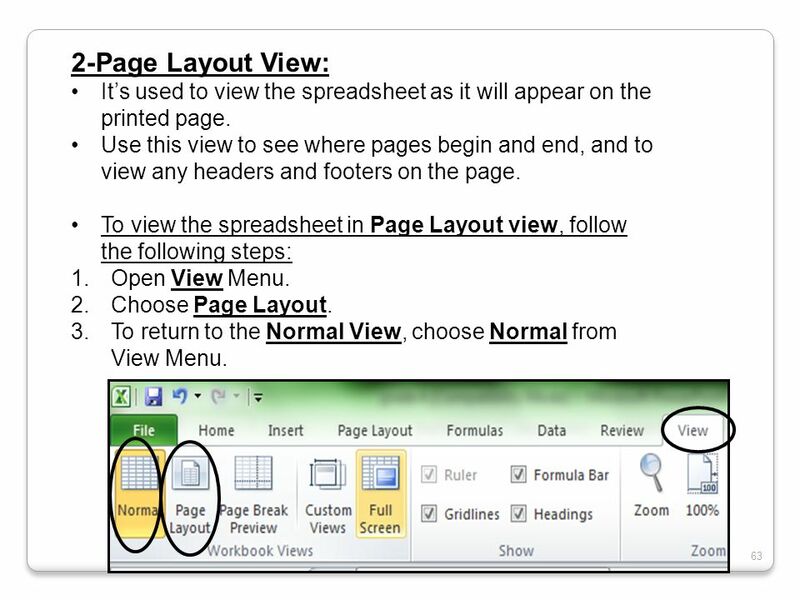 To view the spreadsheet in Page Layout view, follow the following steps: Open View Menu. 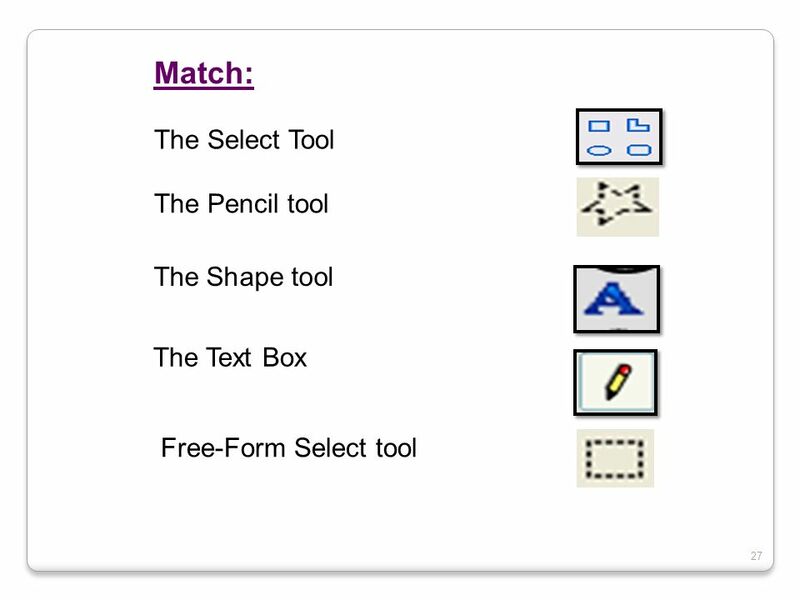 Choose Page Layout. To return to the Normal View, choose Normal from View Menu. 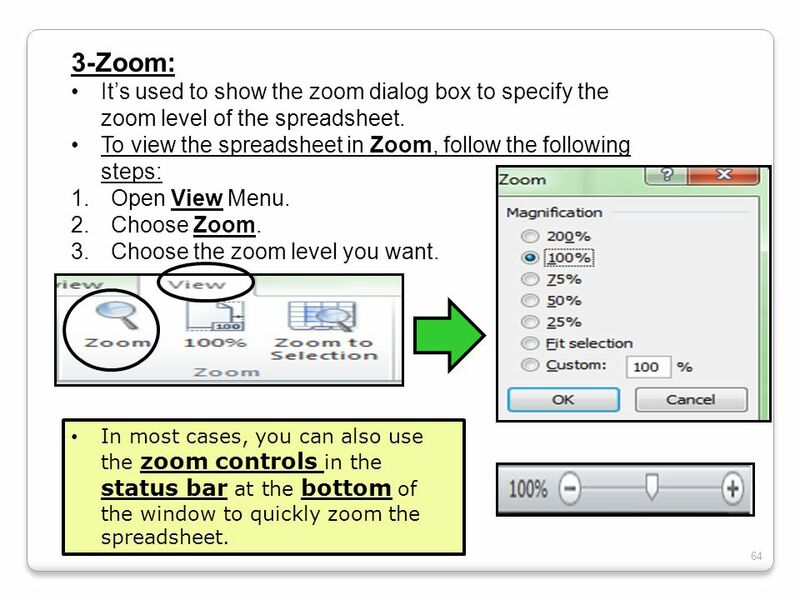 64 3-Zoom: It’s used to show the zoom dialog box to specify the zoom level of the spreadsheet. 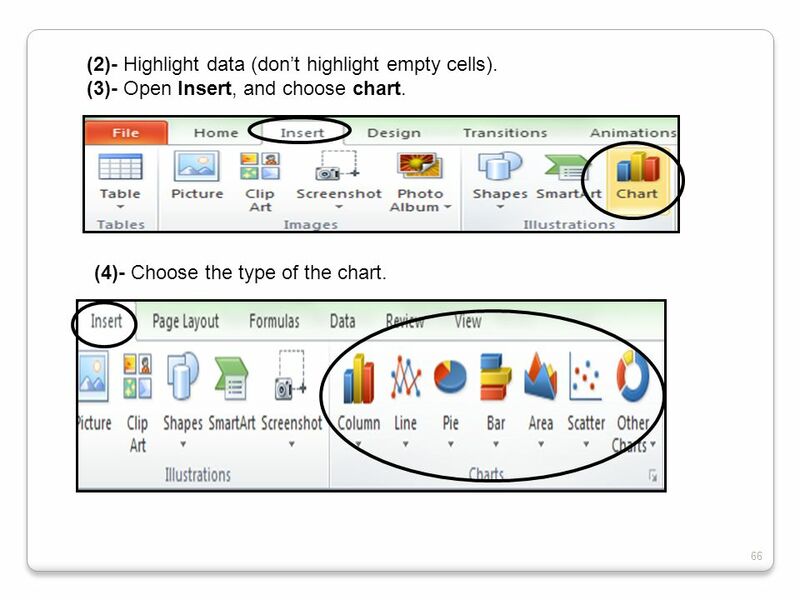 To view the spreadsheet in Zoom, follow the following steps: Open View Menu. Choose Zoom. Choose the zoom level you want. In most cases, you can also use the zoom controls in the status bar at the bottom of the window to quickly zoom the spreadsheet. 66 (2)- Highlight data (don’t highlight empty cells). 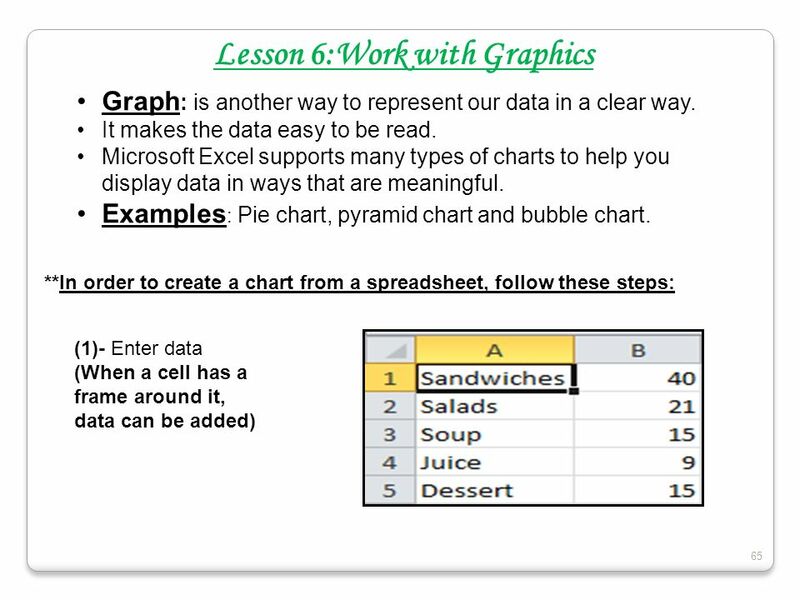 (3)- Open Insert, and choose chart. 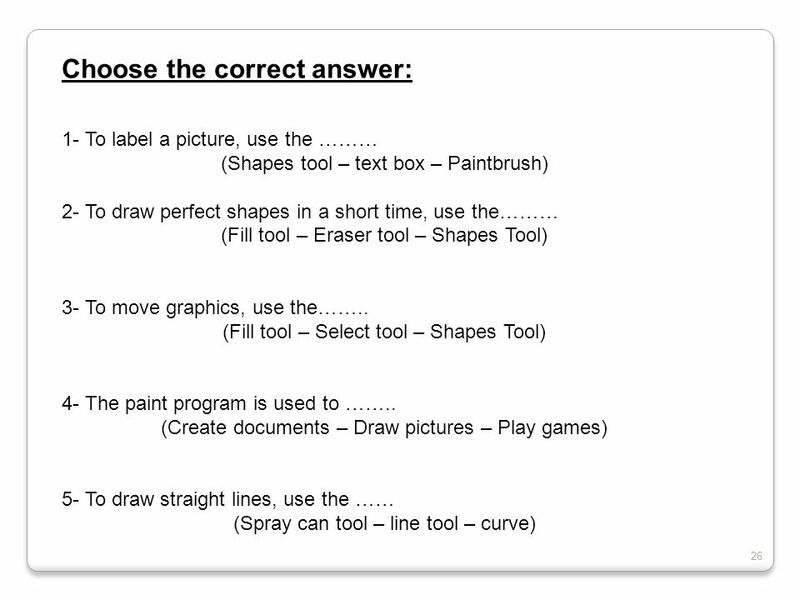 (4)- Choose the type of the chart. 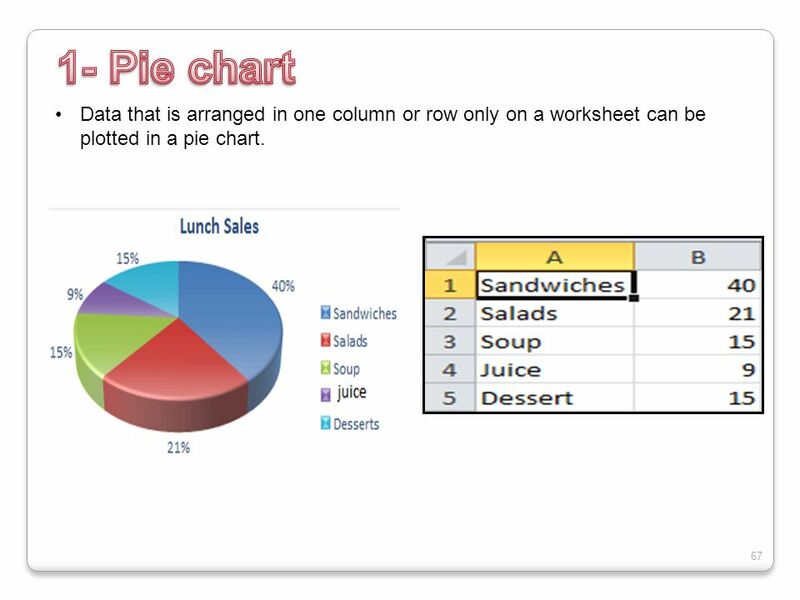 67 1- Pie chart Data that is arranged in one column or row only on a worksheet can be plotted in a pie chart. 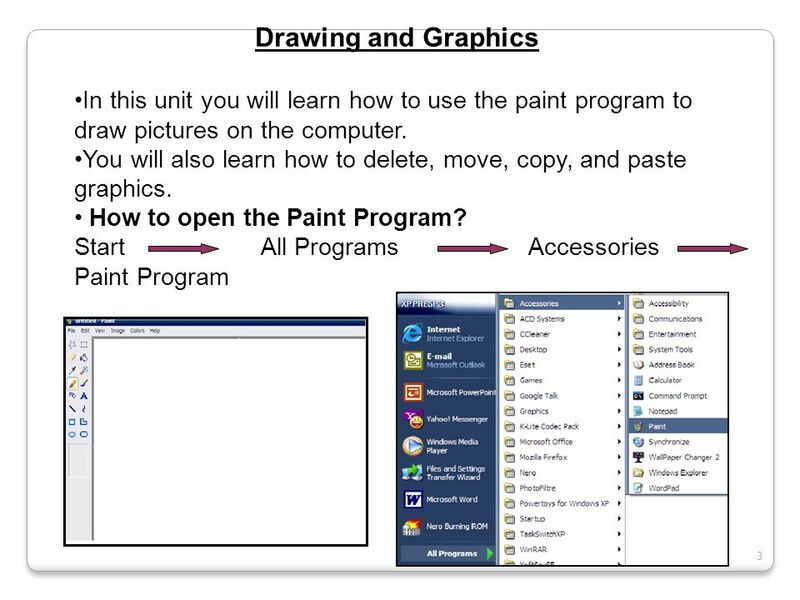 Download ppt "Cairo Modern School Computer for Grade 4 2013-2012."